This coming Wednesday Shona and Olaf too!! This week we have Shona and there is no doubt a guest appearance of Olaf too! 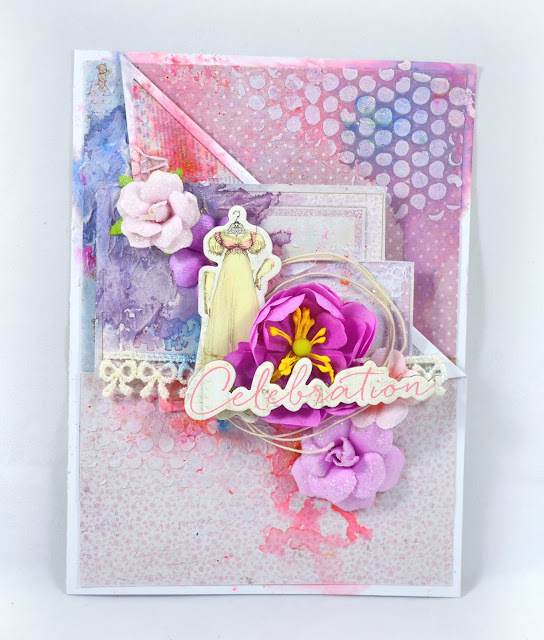 Shona will be using the February Your Passion Your Art kit to show us how to create stunning dimension on this card and tag that she will make from beginning to end! Join us for one hour of fun and lots of tips and techniques this Wednesday at 9:00pm est! Sharing a tutorial today on how to make a tag in 10 minutes. Hopefully this will help you when you're in a rush and need to make a tag for a last minute gift or if you're like me..just plain forgot someone's special day and I had to make one in a hurry! A quick tip-once I picked out my papers, I grabbed those matching flowers and embellies before I began. This way I wasn't searching around for what I wanted. Always start with a sturdy base. Prima Tag Pads are great. Cover your tag with paper. 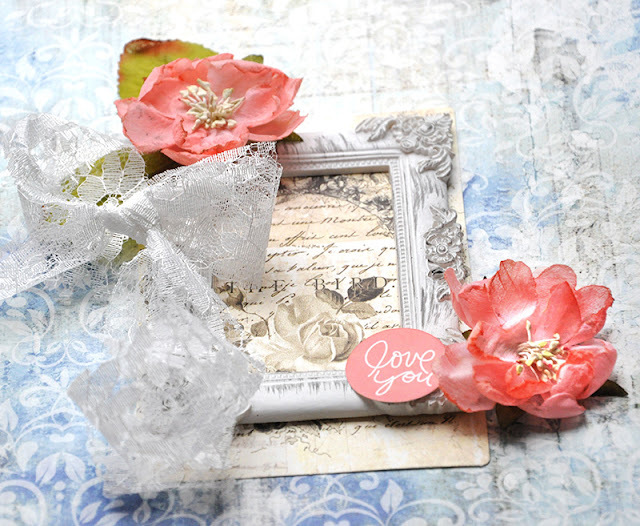 I chose to use Trimcrafts Paper Flowers Paper Pack. I used 3 coordinating papers. Ink the edges. 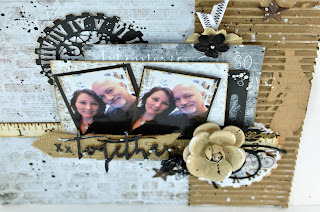 Prima Chalk Inks are great for this. They let you have good control over where your ink goes. 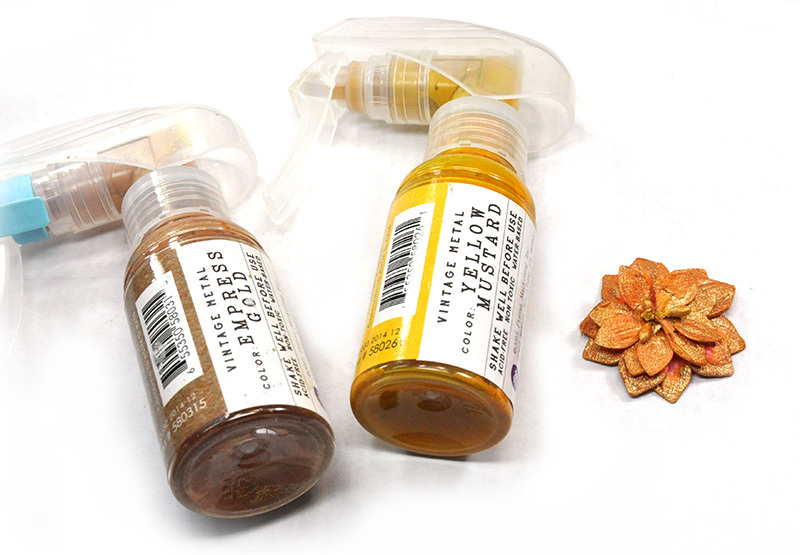 I used Rose Bud and Dark Bark. Cut coordinating papers into rectangles. One bigger than the other and then layer on top of the tag. I inked the edges as well. Add stamp of choice on the background. 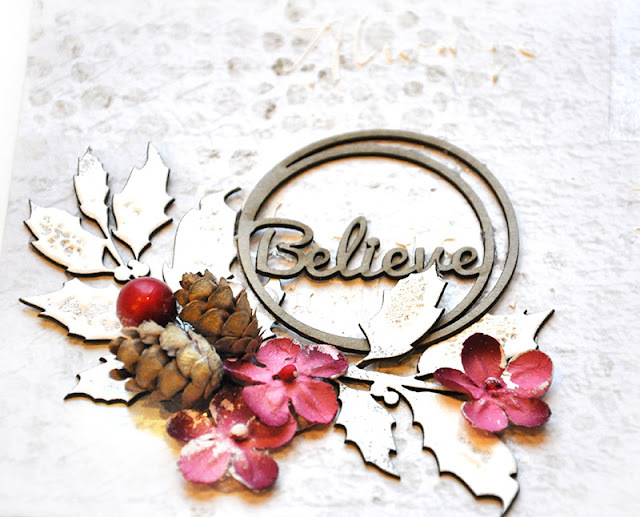 I used Kaisercraft Script Stamp. Last I grabbed those supplies and put my tag together. I used lots of items from my stash. 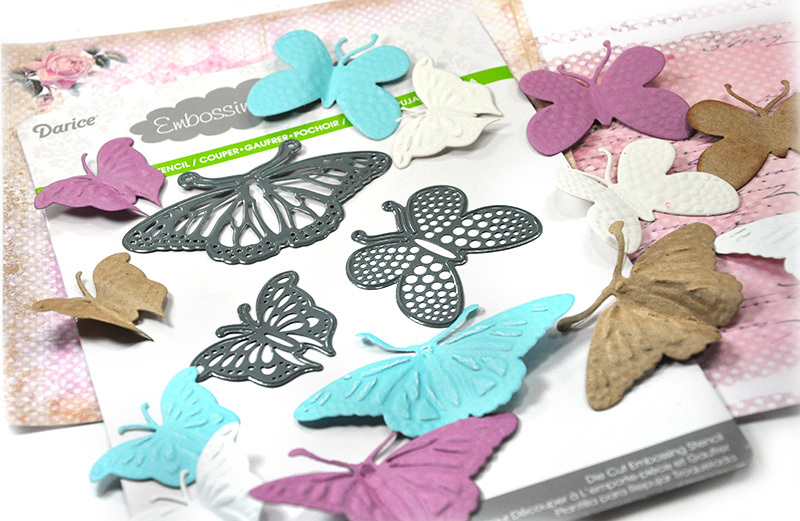 I also used a sheet from the Paper Flowers Pack to cut out the butterflies. So there you go! A quick tag for those last minute gifts! 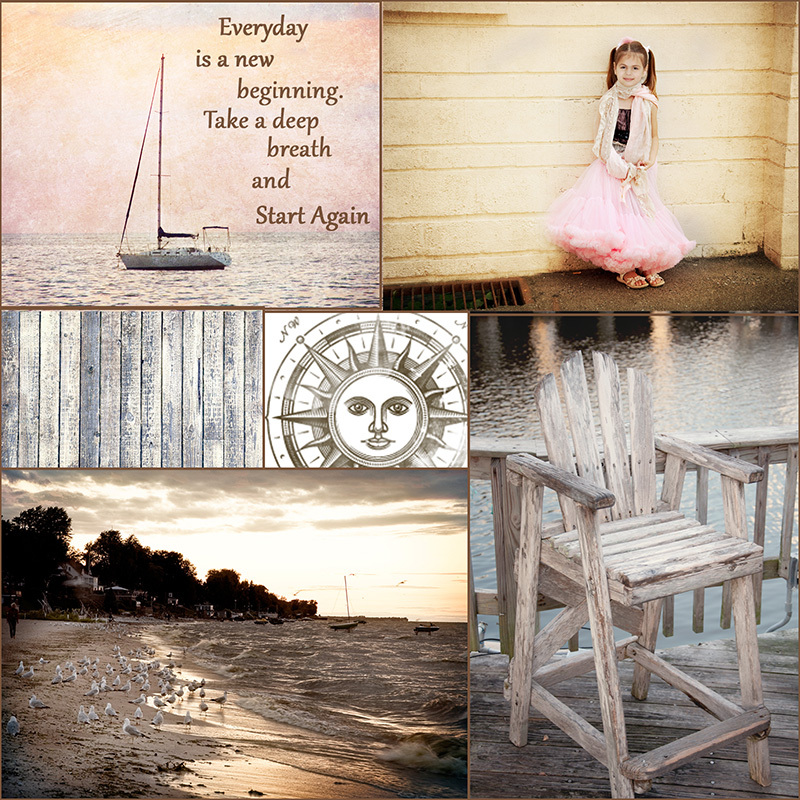 Hope you get inspired to create today! Hello Uni's! Tammy here today. 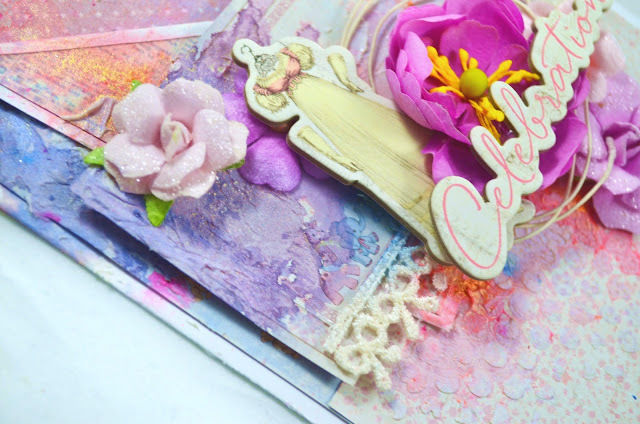 I'm gonna talk about art journaling a bit today.. Have a page that I have done to share.. First let's talk about that art journal book you have. I'm sure you got one setting around.. Unused unloved..If you don't you can make one really easy. Now to address your fears.. That white page setting in front of you.. What do I do? Where to start? I say grab a few bottles of mists and play! Don't try to create anything yet. 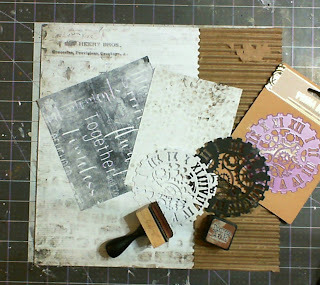 Gesso your page first. Then mist a little here and there.. Maybe add in some water.. Experiment with them.. Then let your page dry. I have covered mine with some 13 Arts mists. I covered mine with blues... And just a little bit of yellow for a bright pop. This is one that I used on a mist review that I have done. Ta Da! No more scary white space!! 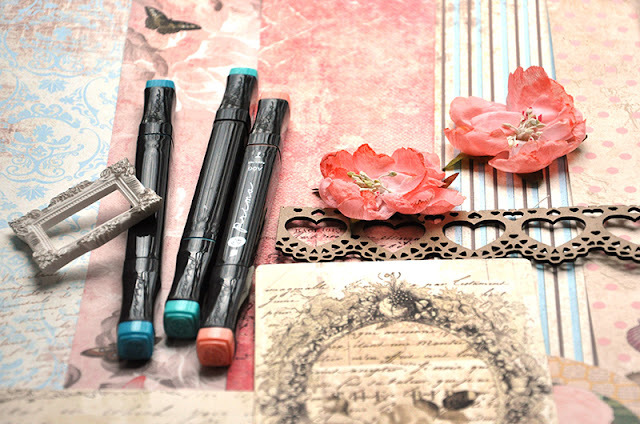 I loved how the colors mixed and mingled together.. Hehe I love blue! :) Ok Tammy what next?!! 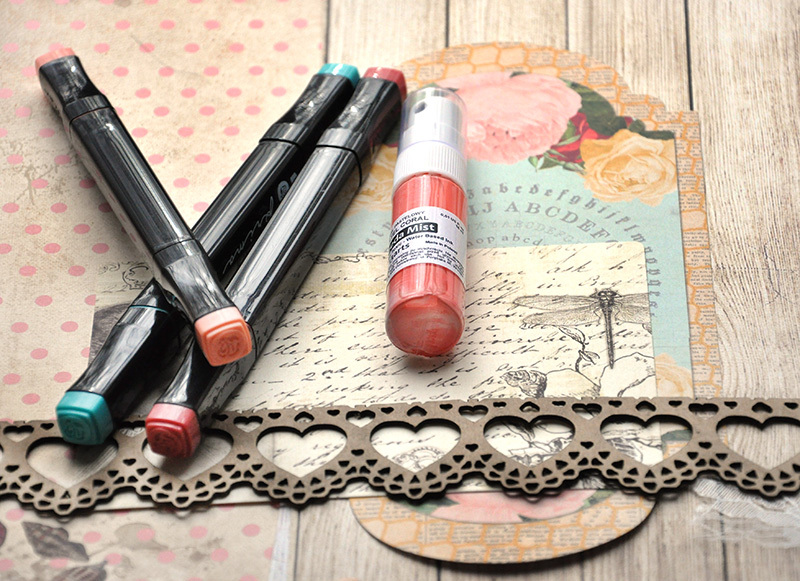 You can start with grabbing a couple of stamps that are collecting dust.. Yup color them. Pull out some watercolor pencils and play. I also added in some Izinks to mine over the top of the colored image. Love how those inks are thick and you don't need a lot to go along way! I don't have a pic of my images separate from my project.. But that is what I say do next. The seaweed is my doodling area.. Fun I seen some doodles on Pinterest and just went from there. There are many doodles out there to get ya jumped started on what to doodle. Here are some close ups. I added a bit of paint here and there.. Some white, blue and black.. Brushed on some of the white Izink to give the look of water ripples. Doodled on some little bubbles and the big bubbles is a water bottle lid. I used a Tim holtz Ray mask in the upper left hand side and dabbed on some Izink over the top of the mask in yellow. To make the Yellow 13 arts mist pop a little more.. 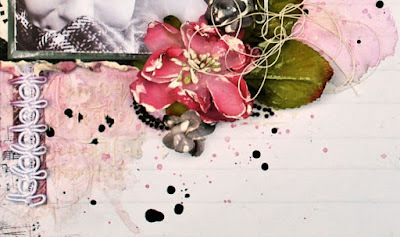 Couple of more close ups..
That is how I got going on this art journal page.. Once the background is done it helps remove some of the fear of the white page. Mermaids are a little spooky but so is doodling for me! LOL So they fit!! 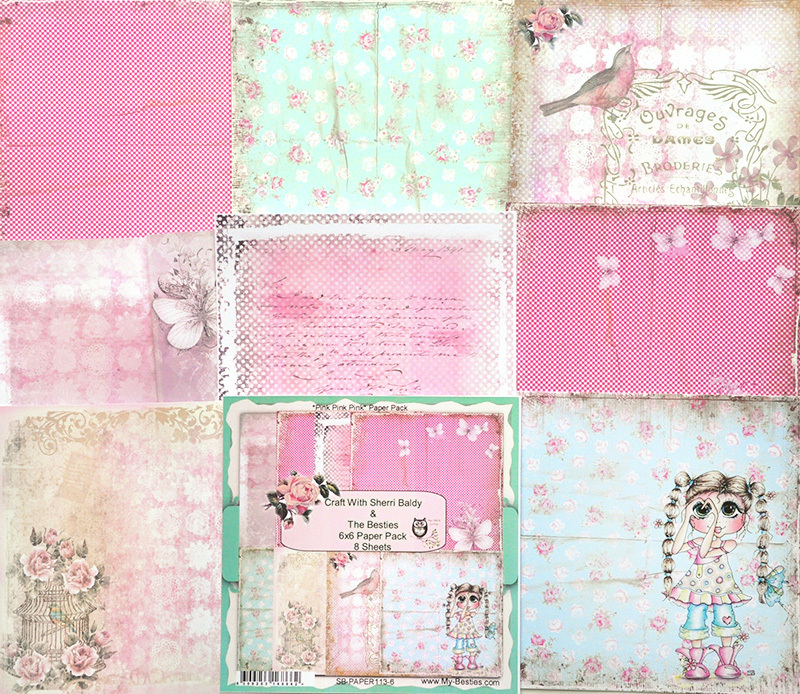 Fun watching it grow into a finished art journal page.. Hope you play in your Art journal today! Faber-Castell watercolor pencils, Black pit pen. We are back and bigger than ever so make sure to spend Wednesday Night with us! 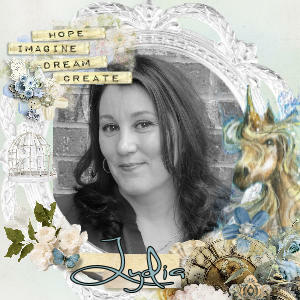 This week we have one of our newest design team members debuting Lydia - yippeee on Uni-stream and this you do not want to miss out on!!! Lydia is going to take us step by step in creating this card and gift bag that can be filled with love, or better yet chocolate - and that is kind of the same thing! So set up your reminder on your computer or phone and join the creative team and members for one hour of a fun learning experience! 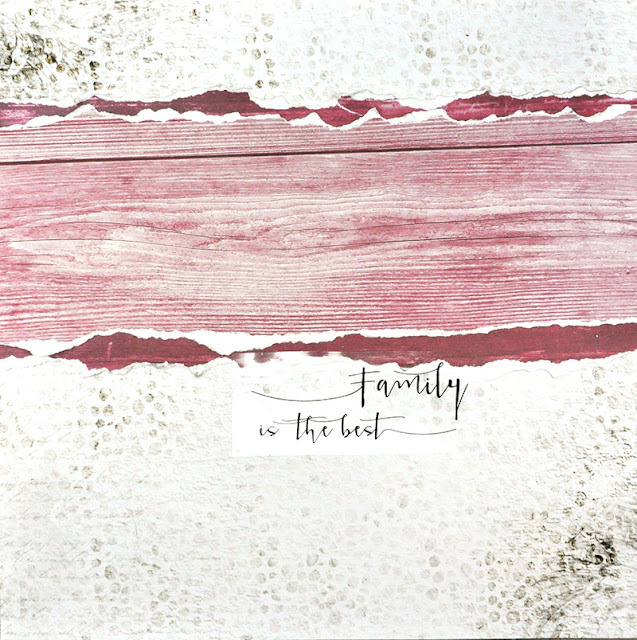 A Non traditional Valentine card with Graphic 45's Typography! 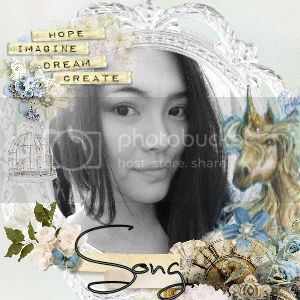 Hello out there in Unicorn land! 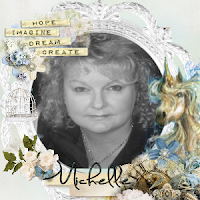 Maggi here, I am so happy to be back on the Unicorn team with all my bestie scrapping gals! I missed all of you! Today I have a non-traditional Valentine's cards for you that is so fun. I've used Graphic 45's Typography collection for this card that I think will be great for the guys in your life. 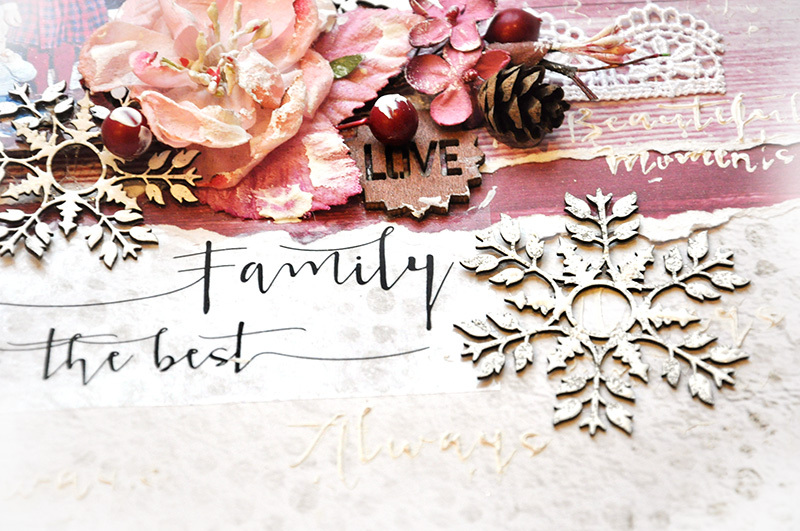 The Flying Unicorn Store still has plenty of Typography on hand, as well as other Graphic 45 collections, so you can make this cards too! For my card I've used Creative Embellishments' Flourish Heart Frame 1 and finished it with Lindy's Golden Lump o' Coal Starburst Mist. 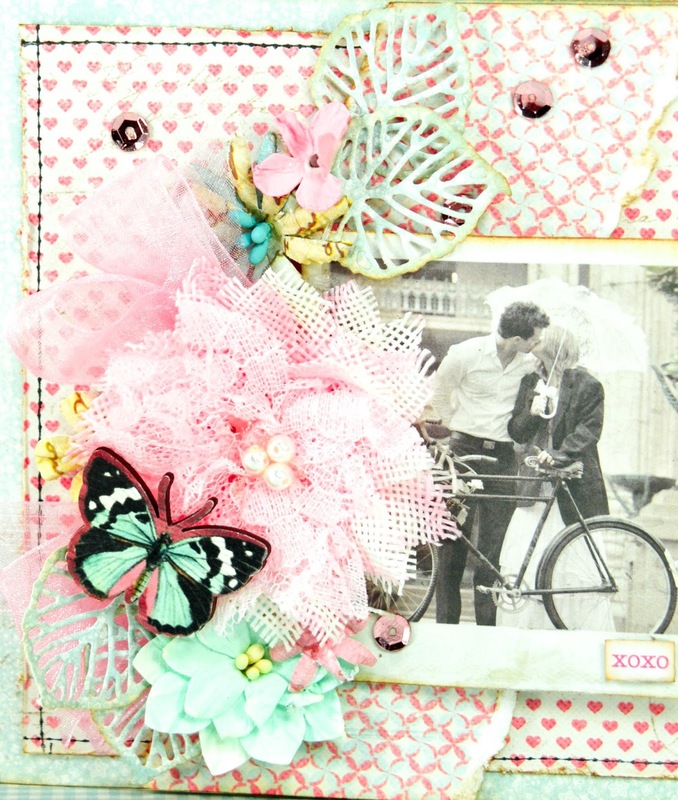 I cut pieces from the Showered with Love Border and added on the sides of my card. Cutting apart your chippies is allowed, :-) because, sometimes you need to do that to get the look you want! Closeup of the chippie I cut apart. It's my turn to share a little creativity with you all. Warning --- photo heavy and I'm being honest. Cover in gesso and smooth out with your fingertips - doesn't have to be perfect. Brace the imperfection - it's easy. 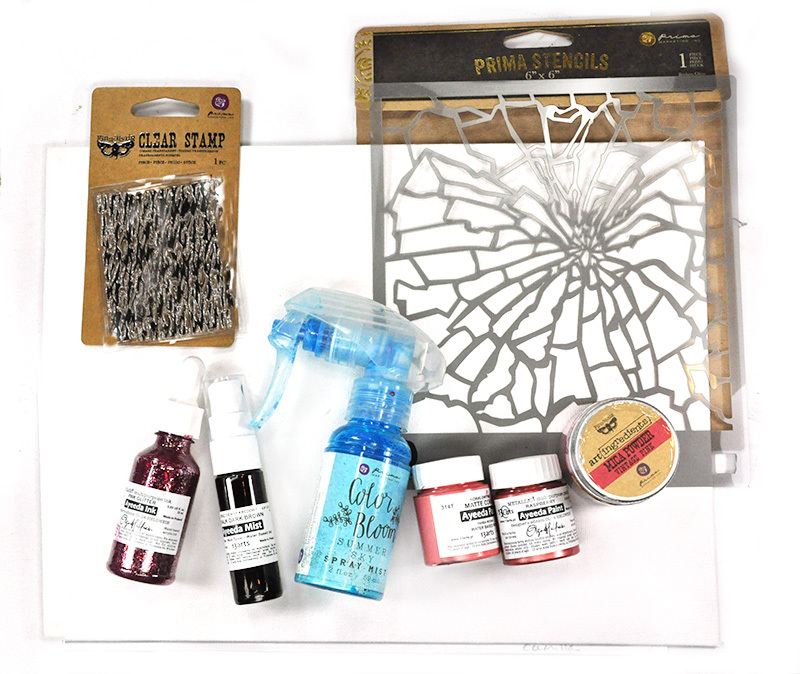 Now, using the following 13 Arts products - slap a dollop of each of them on some cellophane [empty packaging makes it easier for clean up] or put them in a mixing tray and make sure that you mix them all thoroughly. 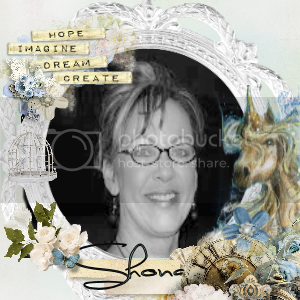 They can all be found in the Flying Unicorn store here and here. I don't measure - I really do grab a dollop of each of them on my spatula/plastic knife and mix. Now apply to your bottle. Wow, look at that texture. Leave to dry - I left my bottle overnight to dry naturally. Now it's time to embellish. I have wound a small piece of muslin [cheesecloth] around the neck of the bottle. I have built up some layers with a chipboard heart at the base of my embellishment cluster and then I have added pearls, stamens, cheesecloth, a Flying Unicorn metal adornment. 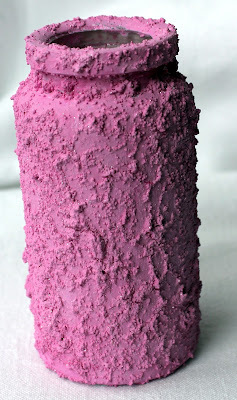 A closer look at the base of the bottle. Lots of texture and see that wee hint of sparkle? 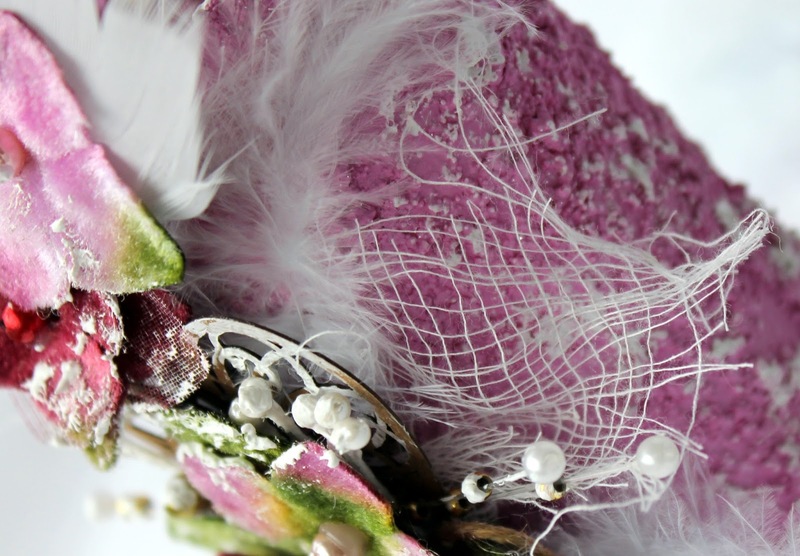 Then I grabbed a couple of white feathers and another few Petaloo velvet flowers and built up another wee embellishment cluster and tucked it under the chipboard heart. You can't really see those fabulous feathers. I must remember not to photograph white feathers on a white background. Doesn't have that wow factor in the photo. I then dry brushed a little more gesso on my raspberry base to tone it down a little. Now what makes this wee bottle so special - it contains a special message. 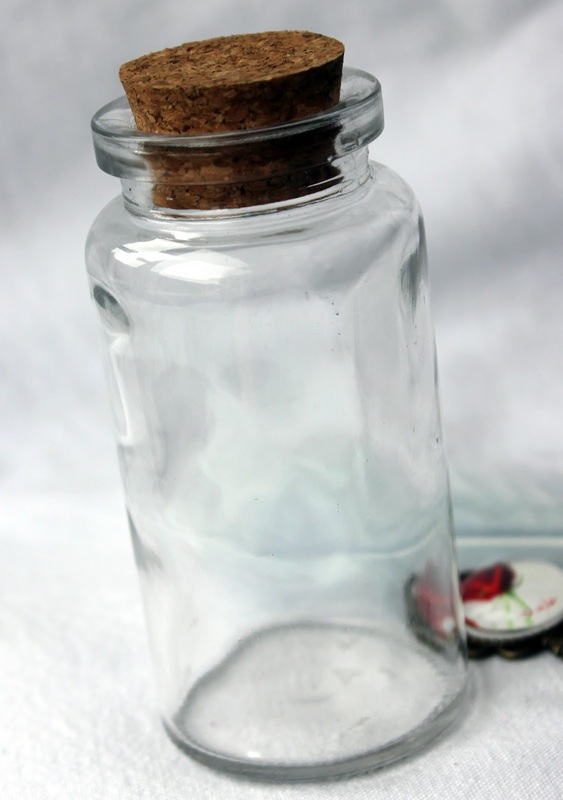 That's right, a message in a bottle. Print off a special poem or perhaps the lyrics to a love song that is special to you and your partner. Roll up into a scroll, tie and pop it in to the top of your bottle. 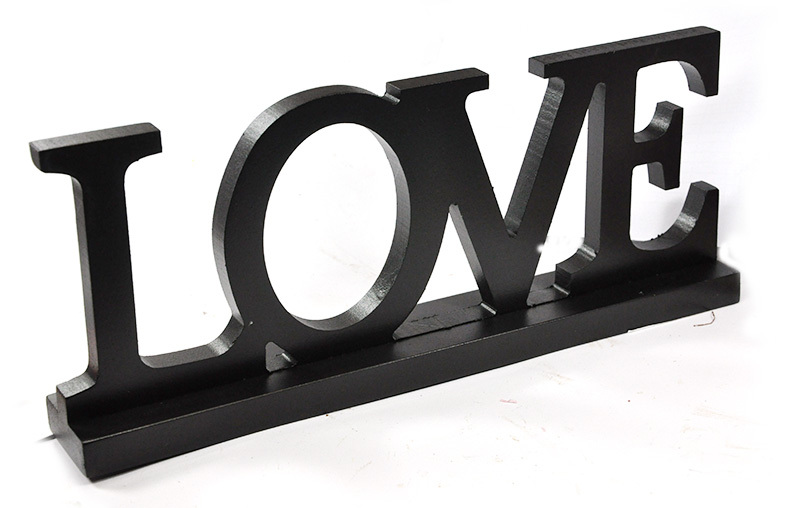 It's coming up to Valentine's Day - something more than a little special. I think it is a fabulous idea for a wedding anniversary gift as well. 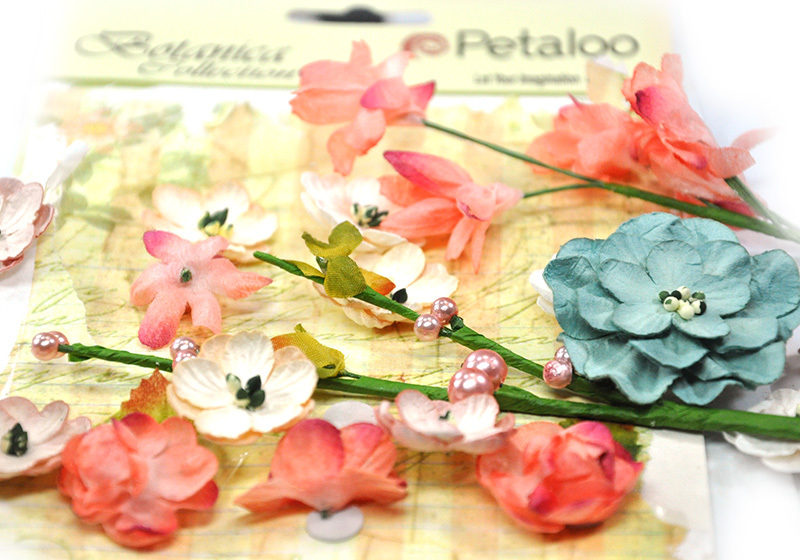 Don't overlook those gorgeous Petaloo velvet flowers in the shop. 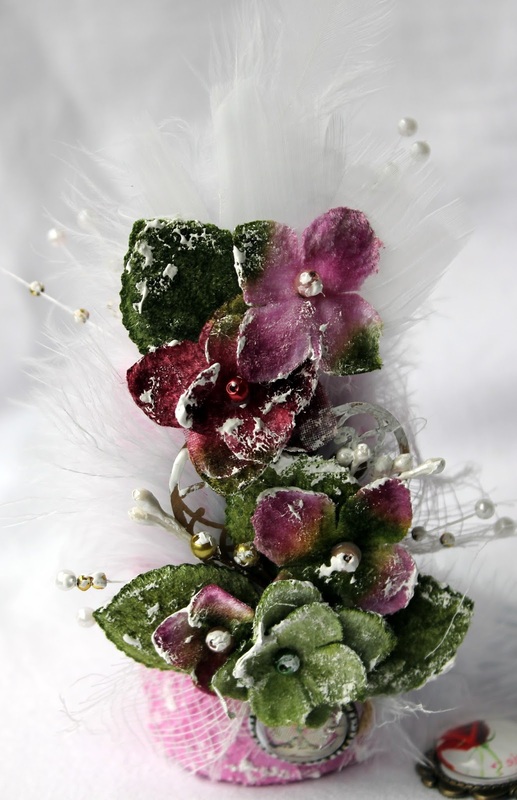 They really are stunning and such fun to create with. 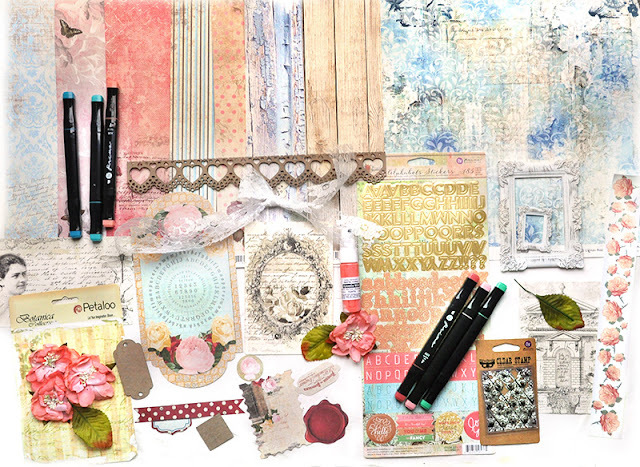 The February kit from the Flying Unicorn is the perfect blend of warmth, nature, earthy and and nautical. 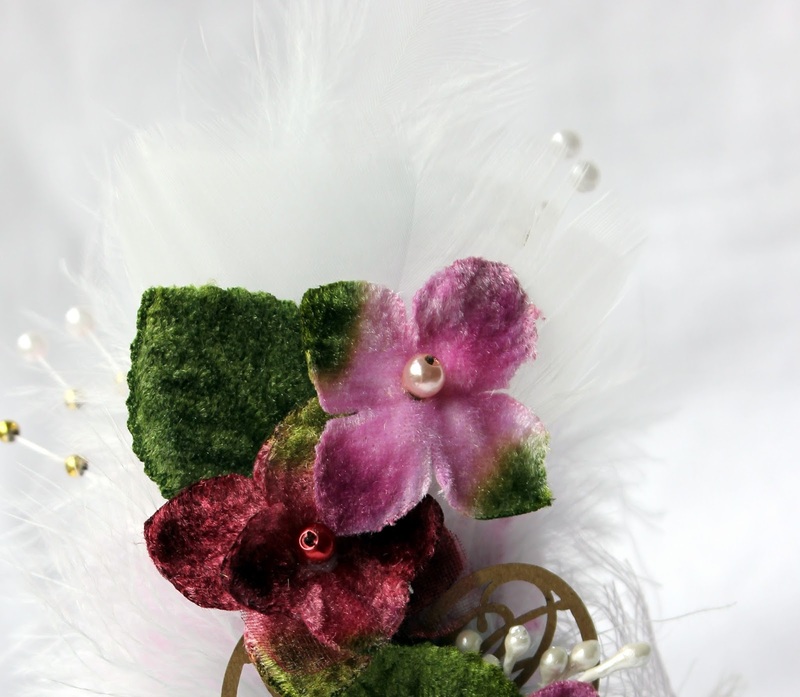 Without further adieu, we offer you our sneak of February "Your Passion. Your Art" kit of the month. 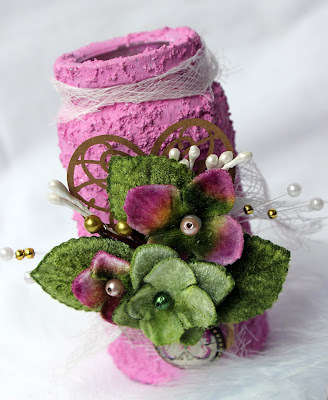 It's Heather today giving you a short pictorial on making a shaker card. I got the idea from a friend at work to make one in a cake theme, so this is what I came up with. 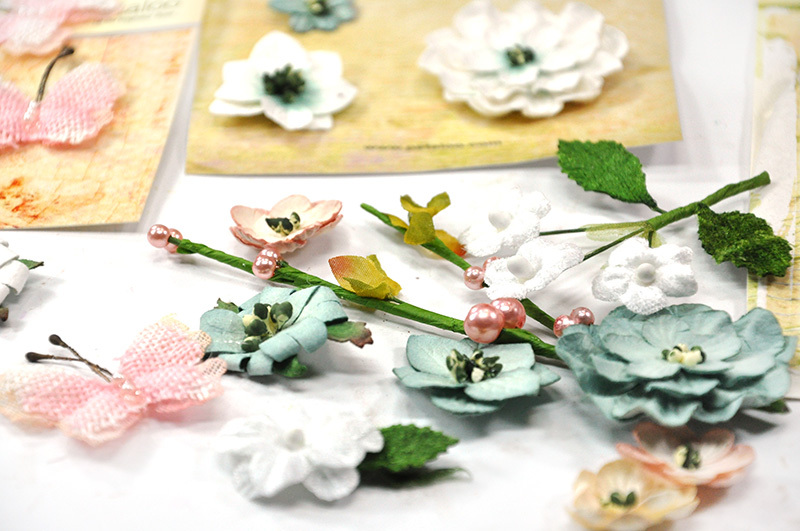 To start of the process I find my paper collection I want to use and the flowers. Everything else can fit in later. 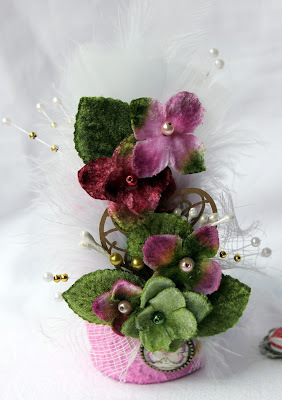 So I chose some Maja Designs and Petaloo Velvet Blooms. I usually make a couple cards at at the same time in case there is an absolute disaster. We all have them. I cut my card stock to make a 6x6 inch card. 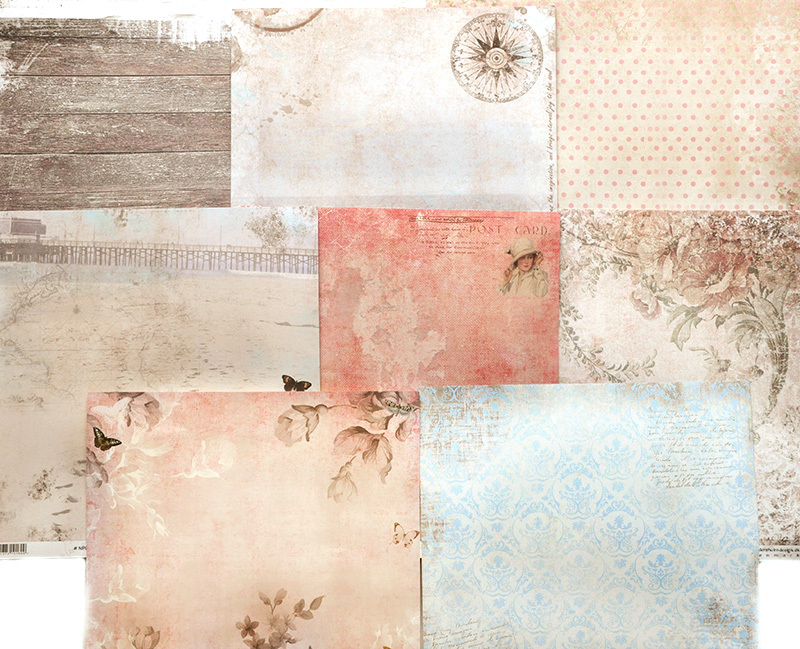 and cut 2 sheets background paper to be layered. To make the Shaker portion of the card I cut both papers 4 3/4" square. Cut one square centered and towards the top. You can buy special plastic sheets to use for your window. 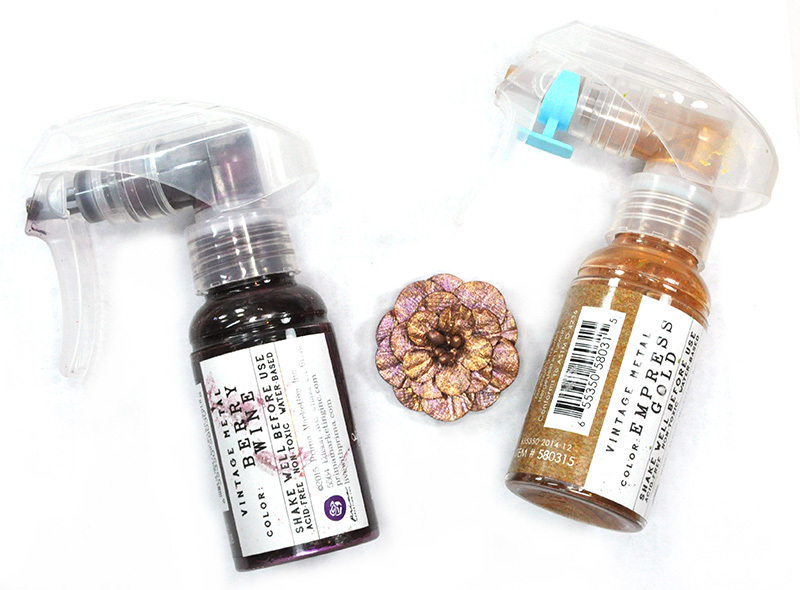 But you can also use the plastic packaging from your supplies. The Petaloo packages work great. I say "use what you have," just make sure they are not scratched up. Measure out the plastic and cut to cover the window. Use some double sided tape, and cover around the whole opening, you don't want any of your yummy filling falling out. Position the plastic film and then use some foam tape to repeat the process. Now for some fun. I like to use a variety of fillers. The more the better. It is surprising how much filler is actually needed to get the effect. After playing, gently remove the backing of the foam tape and put the background paper on to seal the chamber. I used a scalloped boarder die and another sheet of paper to make the pocket for the shaker. 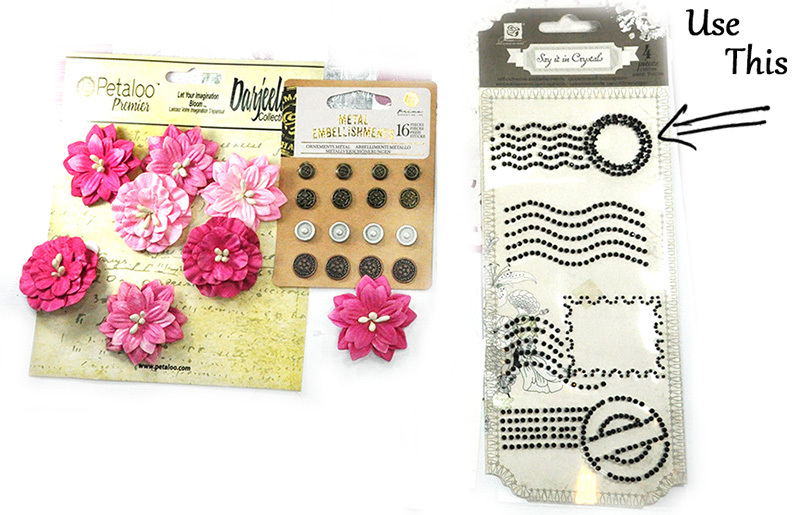 This also gives you a bit more to adhere all the goodies and embellishments to. So after some scoring and folding, its time to adhere to the card base. I used some double sided tape. I added some extra glitter to the paste while it was still wet. 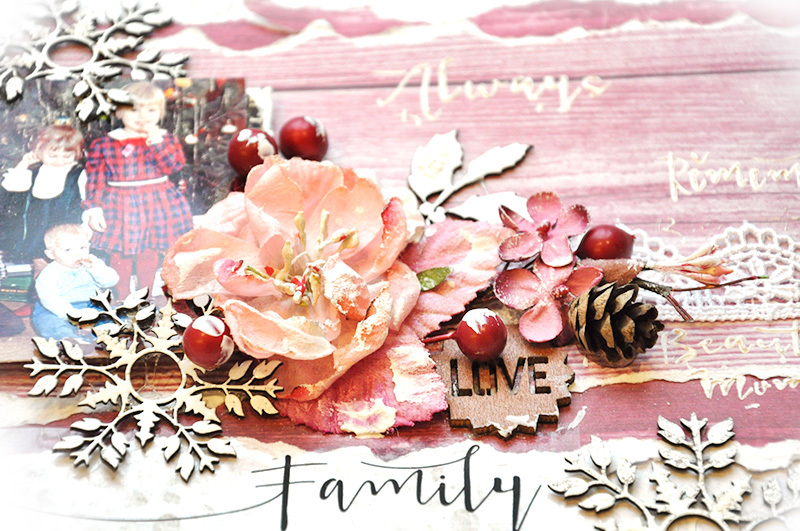 Flower cluster and sentiment time. 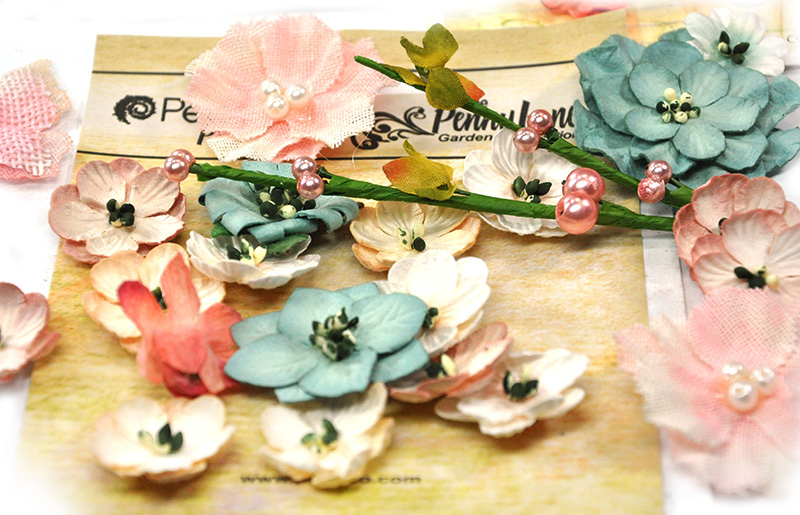 The Petaloo Velvet flowers add some great texture to any project, but I wanted to soften them up a smudge to work better with the paper selection. 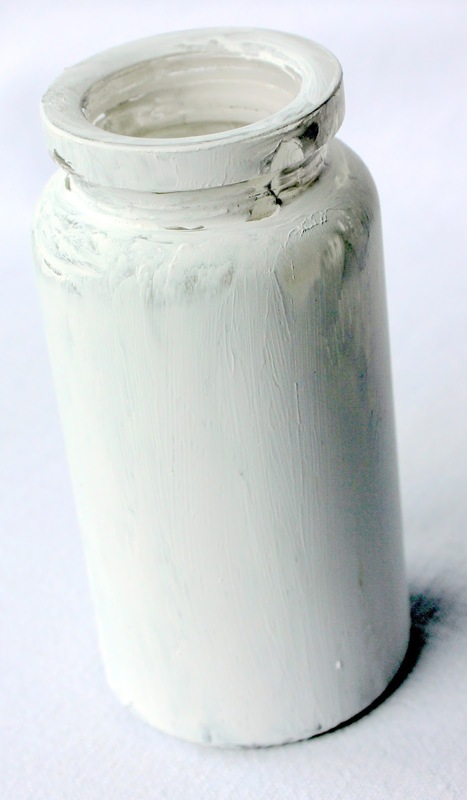 I just dry brush on some white 13@rts Gesso until I get the look I am looking for. I used a straw and some tissue paper to make the candle. If you have any questions on the process, just let me know. 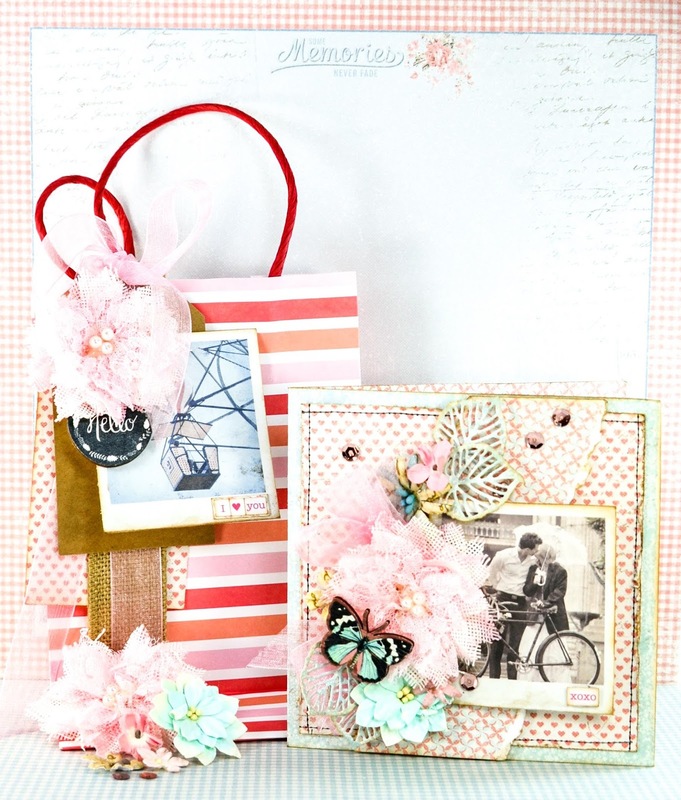 These are fun cards to make and you can make them in any shape or size . 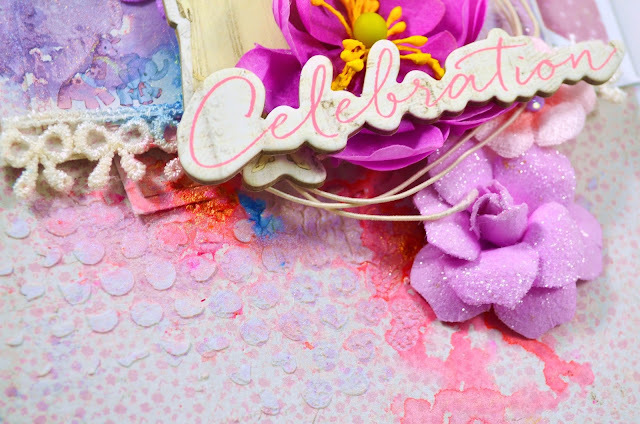 Stamping' Up Birthday Blossoms, Banners Punch; Ranger Embossing Dabber, Tim Holtz Distress Stickles; Sequins from My one stash; Double Sided Tape, Foam Tape. Today, I share with you a quick step by step tutorial on how I created this month's OTP project. This set of coasters is part of the Your Passion Your Art January Kit. First, let me show the final result. 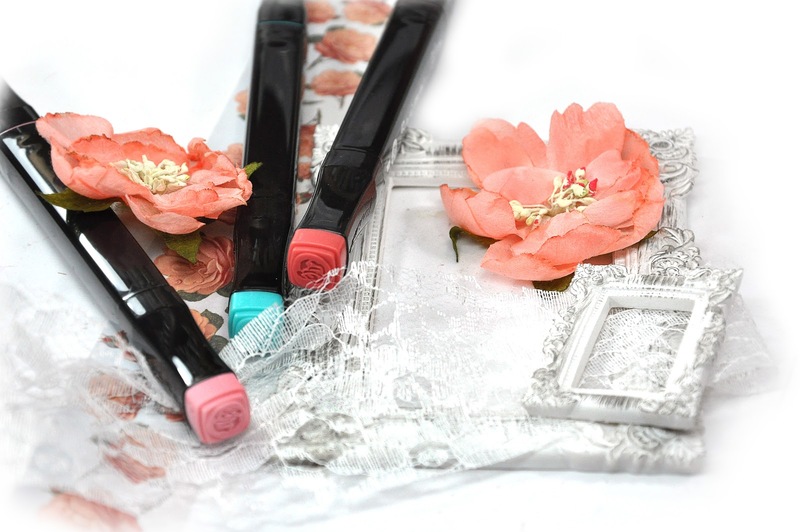 I will link the products as I go in case you would like to check them out! First I used Tim Holtz Distress Stains and just scribbled all over the pages. I then spritzed with water. Using a coordinating color of Distress Stain, I went around the edges of the pages and repeated the process. Taking a Prima Chalk Ink (Dark Rust) I inked the edges. Inking the edges helps to cover any 'white' areas that may be showing. Cut out a circle. I used a sheet of Bo Bunny Autumn Song. Now to work on my sun. I mixed some Molding Paste with 13 Arts yellow paint. 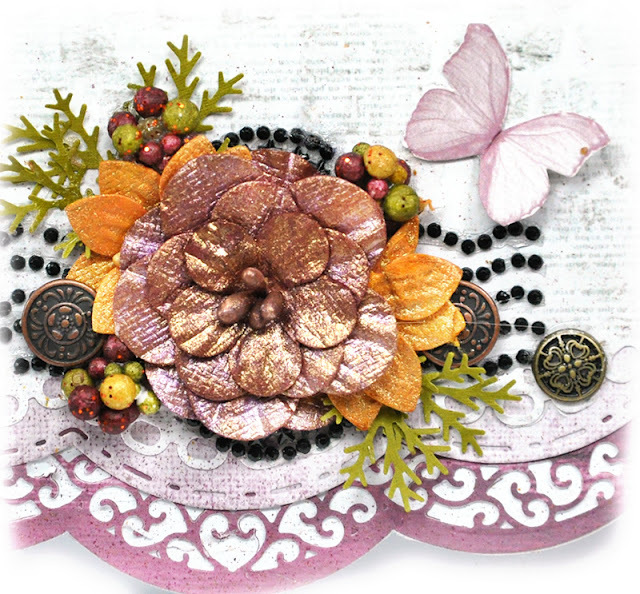 I traced the outline of the sun where I wanted it placed and then added the rays using Tim Holtz Rays Stencil. 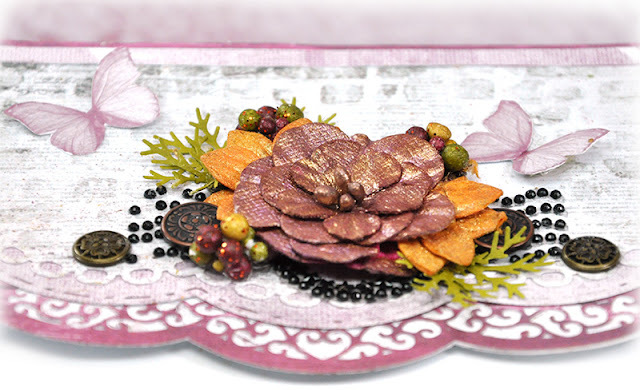 Using Festive Berries and Rusty Hinge Distress Inks, I added some shading...or tried too...to the page. Using a stencil from 13 arts and some Prima Texture Paste, I added my stars. 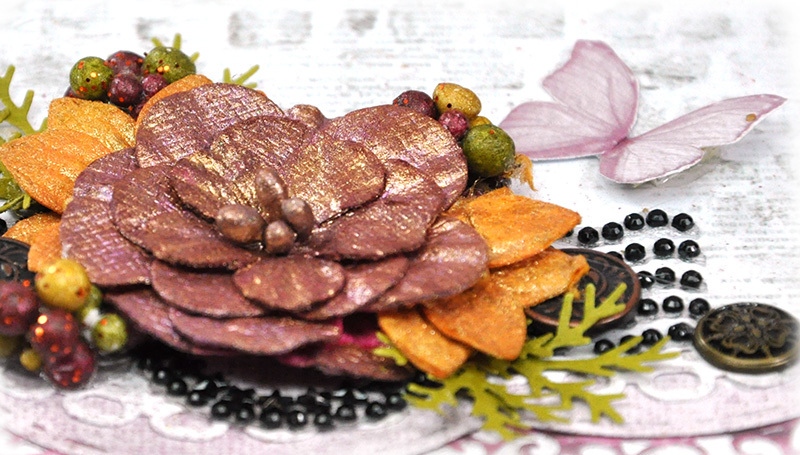 Mixed some 13 arts Gold paint with a little bit of water which was used to add some splashes of color. I also repeated that using white paint. I grabbed some old chippie letters and covered them with Distress Stain as well. 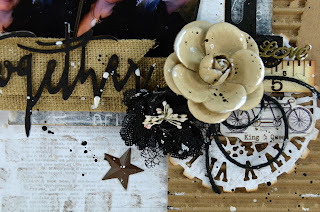 I dried these with a heat gun and then added some Tim Holtz Crackle glaze. After the glazed dried I added my quote, outlined some of the rays with thin red pen and that's it! What I like about art journaling, is there are no mistakes. Each step is a learning curve for me. Although it's not quite what I had pictured it would be, it has inspired me to keep going! Hope you get creative today! This week we have our dearest Tammy debuting on Uni-stream and this you do not want to miss out on!!! 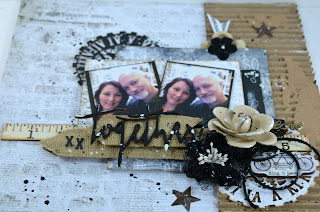 Tammy is going to take us step by step in creating this one of a kind fun mixed media tag with so many techniques and details ... ahh so much to learn! So put the tea kettle on and join the uni team and your friends for an hour of educational fun! Stampotique Stamp "Mark Twain saying"
We've sure been that, almost 25 years already! Through thick and thin! Today is my first Today post and I would like to share with you the process of making this more masculine layout. 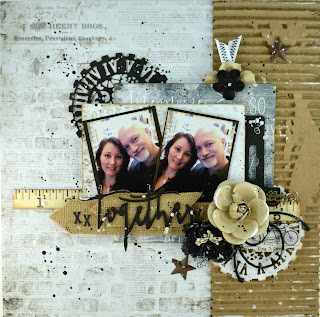 Most of the items I've used are from this months Your Passion Your Art - Main Kit, the Small Art Big Passion Kit and the Mixed Art Passion Kit and some things from previous kits and things I had lying around. 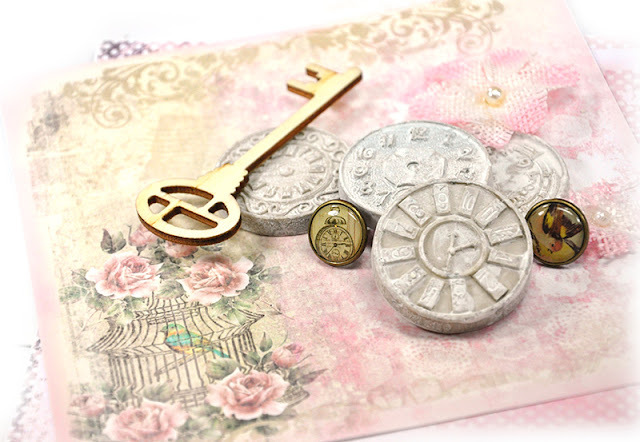 I also finally got a around to use the new Prima Metal Die - Vintage Clock. I started of with one of the sheets from the 13 @rts Secret Letter Collection and adhered some corrugated cardboard to the right hand side of the paper. All I used was a part of one of the boxes my kit came in. Recycling at it's best. Just rip off the top and it looks best if it's not too neat. I cut out a square piece of paper (6x6) and a different piece (4x6) ran the die through my machine twice. Once with a black piece of backing from a Prima Flower pack and once with paper from the 6x6 pack in the Small Arts Kit. Some inking around the edges and we're ready to start sticking it down. Since I want to keep the colors on this layout to a minimum I used to top of the flower pack as a tag and backing for my pictures. 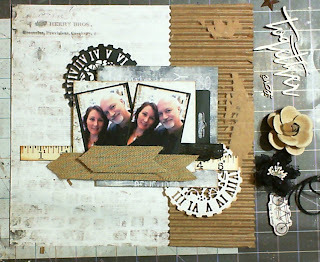 From last months kit I used the cute wooden ruler as an accent and cut arrows out of jute ribbon. 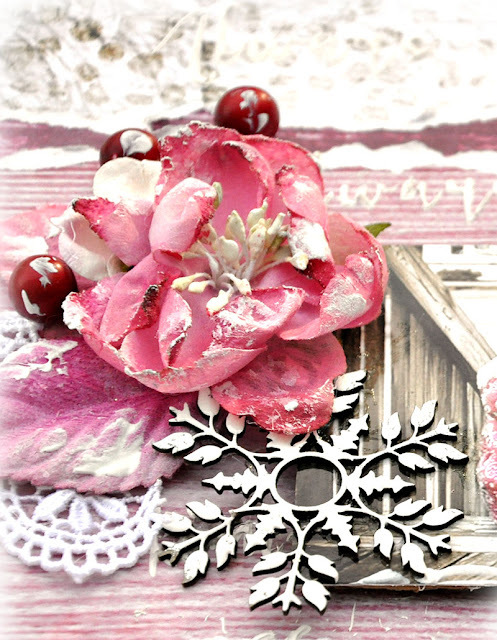 The basics of my layout are done, we just have to decorate with flowers, a title and some other litle things. Below you can follow the whole process on the video! I hope you enjoy watching it! Below a few more close-ups of my layout and a list of used products. Hello all, it's Heather here today and it's time for another "Build A Page". Building a Page is essentially the process of building a layout. 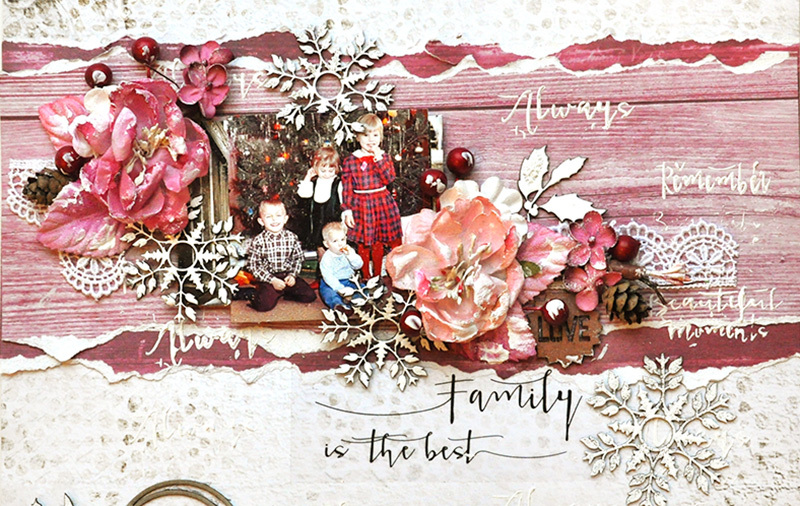 I used the January Main Kit and some of the goodies from the December Kit. This layout is simple and clean. I love the 13@rts paper, but wanted to get away from the pink with this picture of Maksim and the teal from the previous December worked perfect. I used some gesso and added some 13@rts Turquoise ink to it. 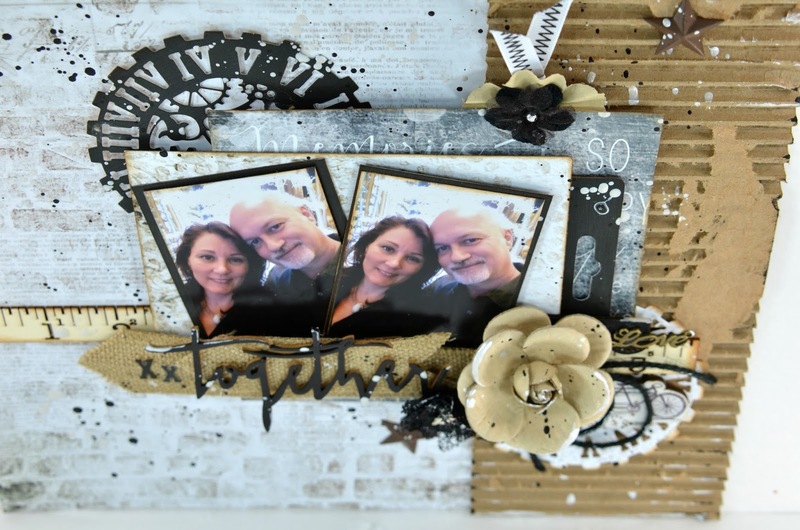 Then added some subtle texture to the background with the stencil the come in the kit. Here's the video process for this BAP. Enjoy! 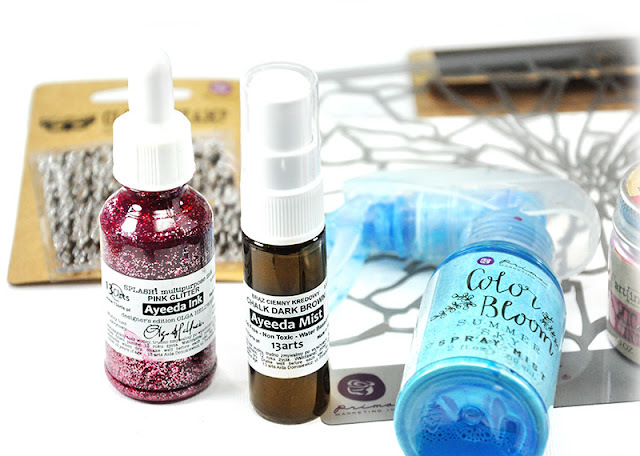 There are always tons of goodies in the kits. If you don't have something in this one, you will find it in another. These kits are amazing. January Mixed Passion - Petaloo Textured Blossoms Black, Burlaps Blossoms Black. 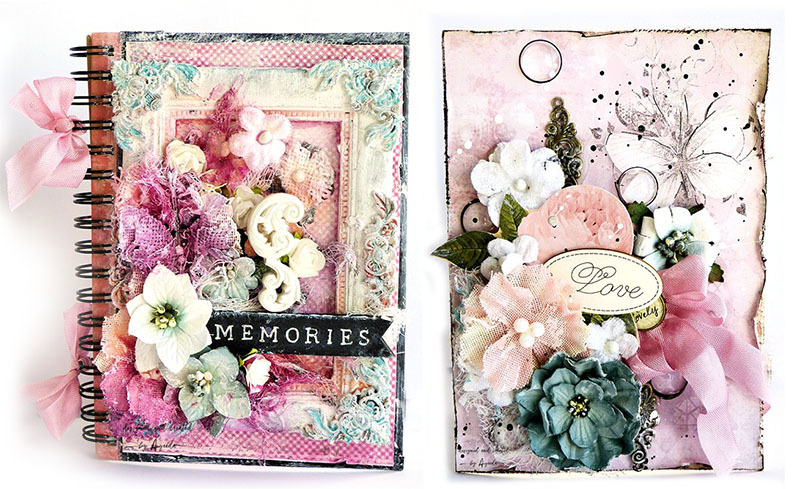 January Small Arts Big Passion - Prima Metal Embellishments, 13@rts Secret Letters 6x6 Paper Pad. January Mixed Art - 13@rts Silver Glitter Paint. Hi there! 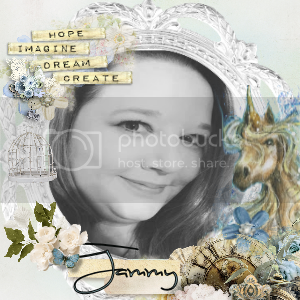 Jennifer Snyder here to share a page made using the January Kit for the Flying Unicorns, "Your Passion Your Art" as well as flowers from the January Flying Unicorns Mixed Passion flower add-on. 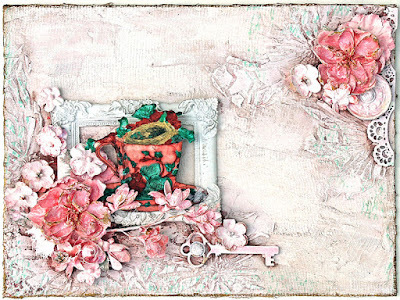 This month, the papers are from 13Arts - Secret Letters Collection. Little bit about the photo. I pulled this particular photo out because it's darling of course, but also because I am pulling the red from my sister's beautiful 1960's fancy party dress. I joke of course, however I am betting everyone thought we looked just "swell" back then. If my sister is in red, then I'm the crazy gal in dark green, along with my older and younger brothers. Back to the layout. I thought I'd pair the collection with some gorgeous new chipboard pieces from 2Crafty that I had recently acquired. I used 2Crafty "St Nick's Snowflakes", "Word Circles Christmas", "Holly Twig Branches". 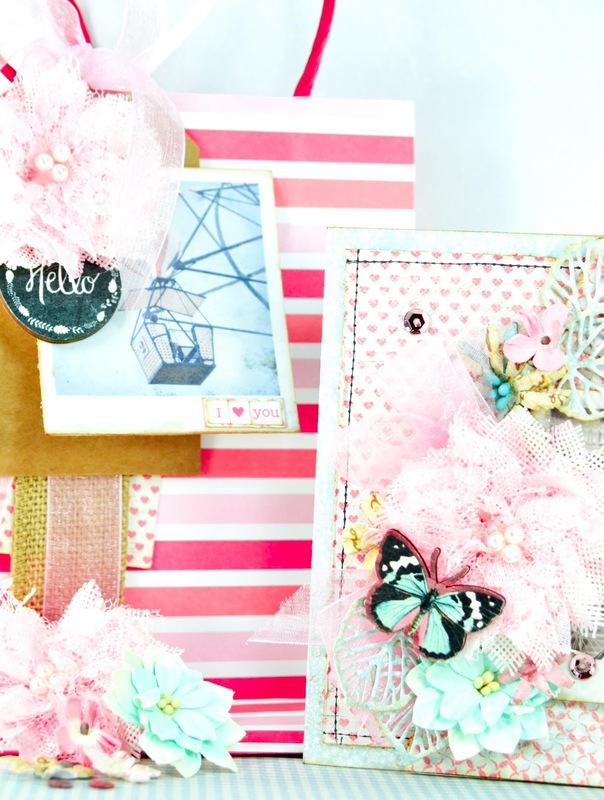 Flying Unicorns carries a variety of chipboard brands found right here in addition to the 2Crafty brand I used. You can find gorgeous chipboard from Creative Embellishments ( with wonderful holiday chippies still available), FabScraps, UHK Studios, Maya Road, Prima, 13Arts, Studio 75 and much much more. 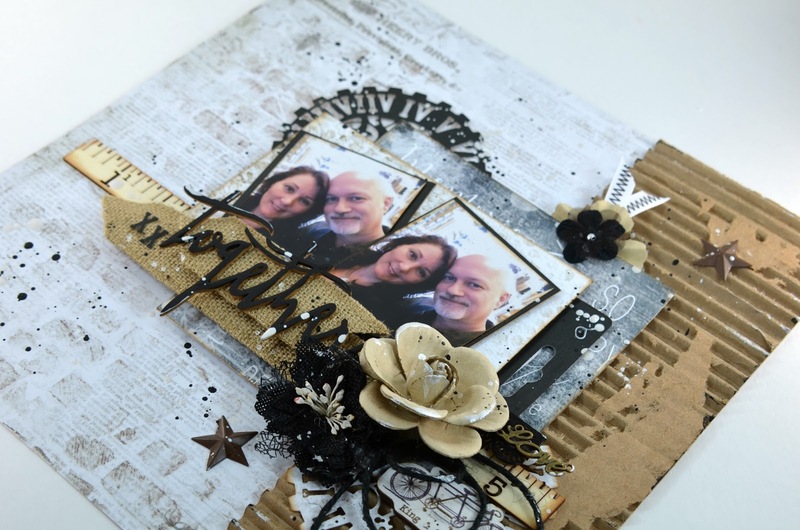 Is Chipboard Difficult to use? 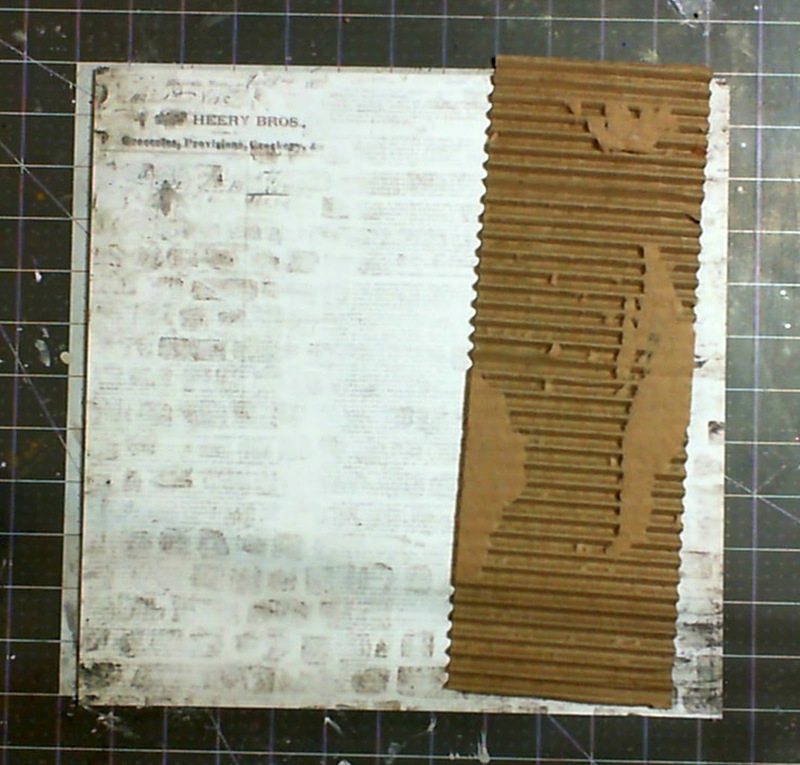 Chipboard is like really heavy, hard, cardboard. That's the best way I can describe it. 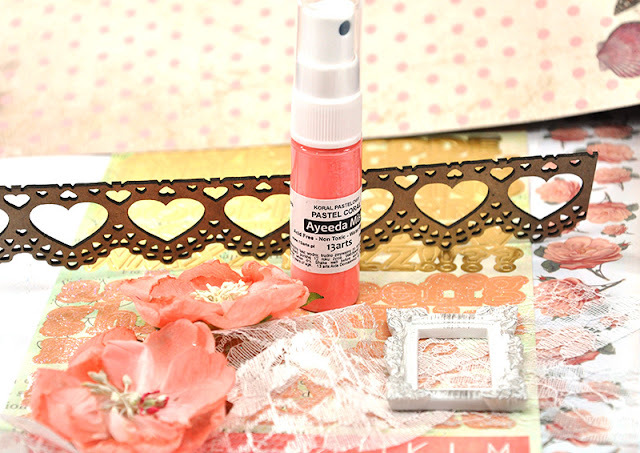 It's very easy to use and glues easily to projects. For those concerned about keeping layouts and cards flat for easy shipping, no problem. They are wafer thin. 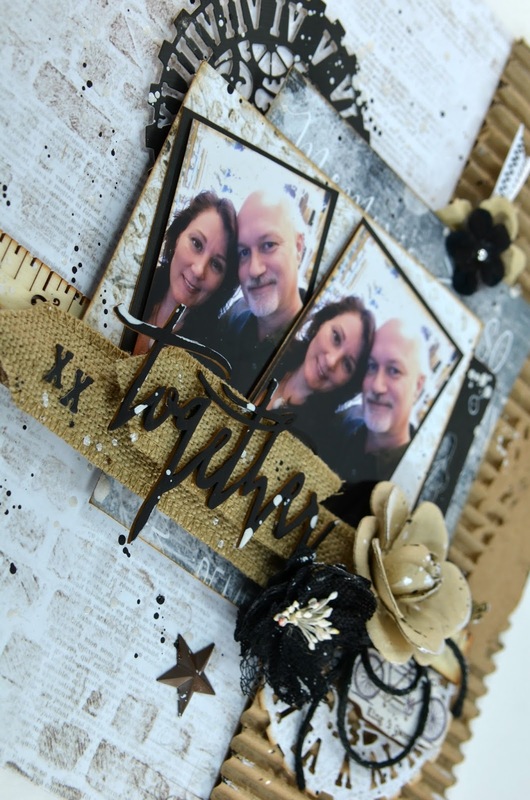 Chipboard can be treated/altered with countless products - paint, ink, embossing, rub-ons. BUT they are also perfectly head-turning left alone or kept simple. In the photo below, I left the ""Word Circles Christmas" totally plain and unfinished while I coated the "Holly Twig Branches" with white embossing enamel. This is just how beautiful clustering is when you add some 2Crafty chipboard. 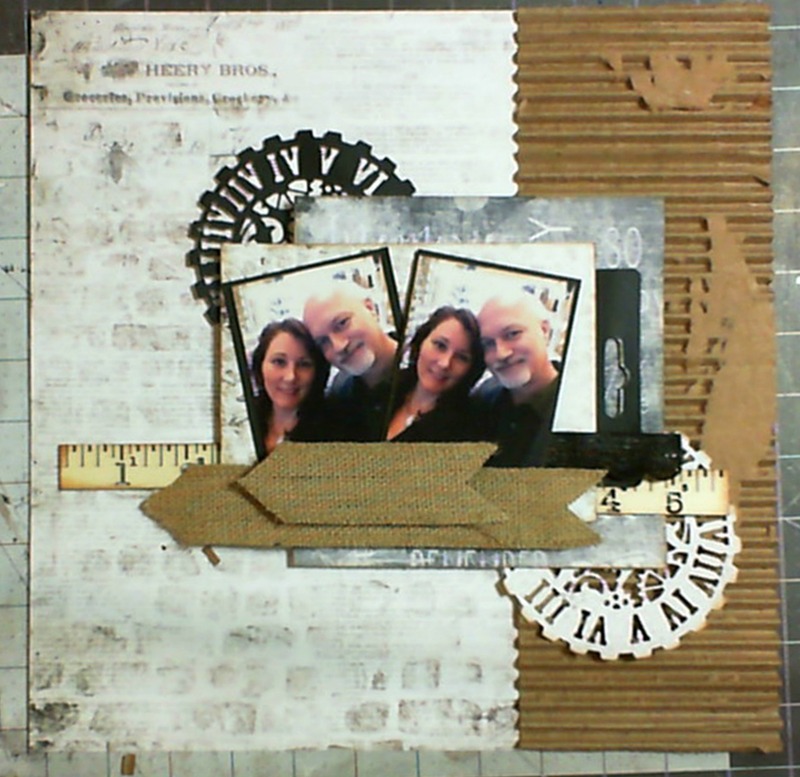 You can find a variety of 2Crafty chipboard right here. 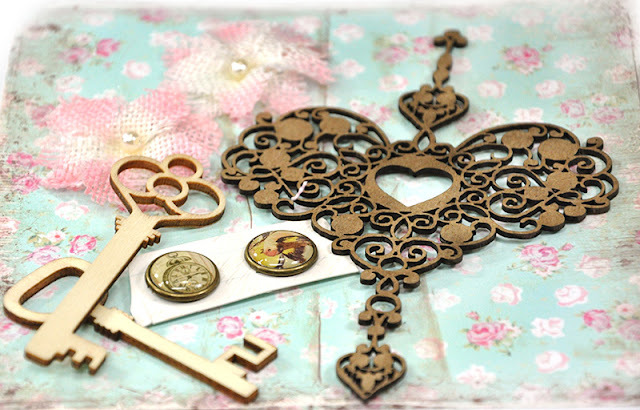 Other chipboard brands can be found here. 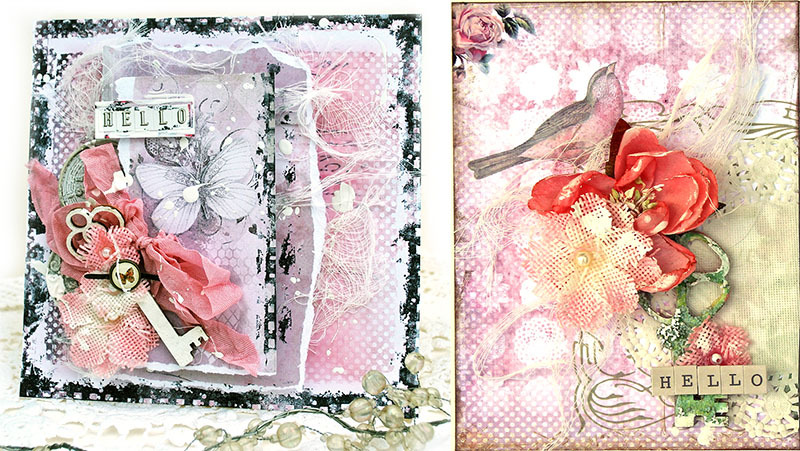 These are my layers - created from layers of 13Arts papers from the Flying Unicorn January kit of the month , "Your Passion Your Art". I also added some sentiment stickers from 13Arts Secret Letters collection as well from the main kit ( found here). 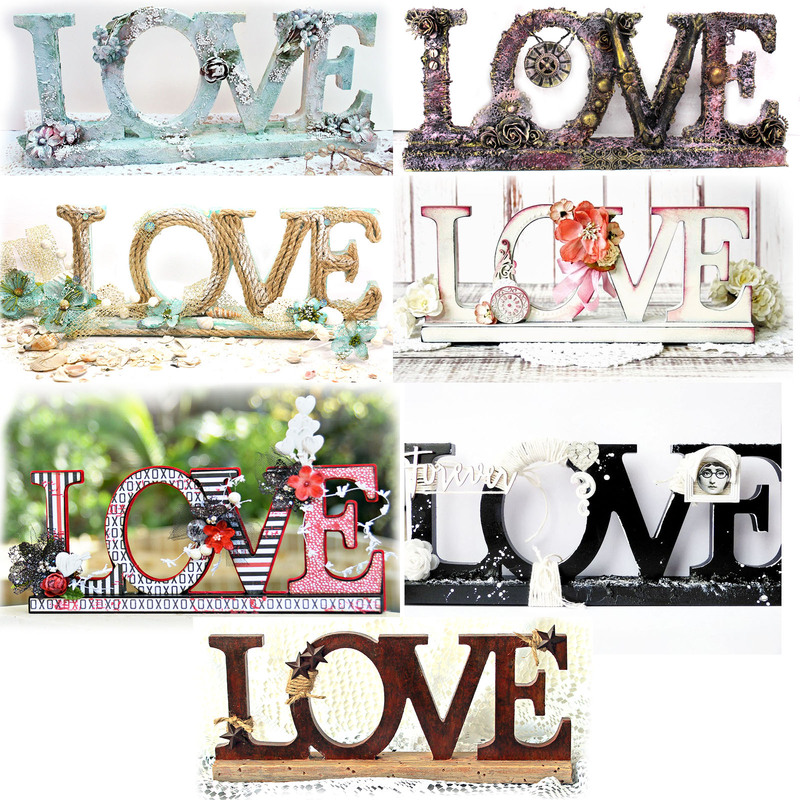 These are very cool sentiments printed on clear acetate. They transfer to a page or card quite well. I added Prima Color Bloom " Frost" mist to the Prima leaves from the flowers. 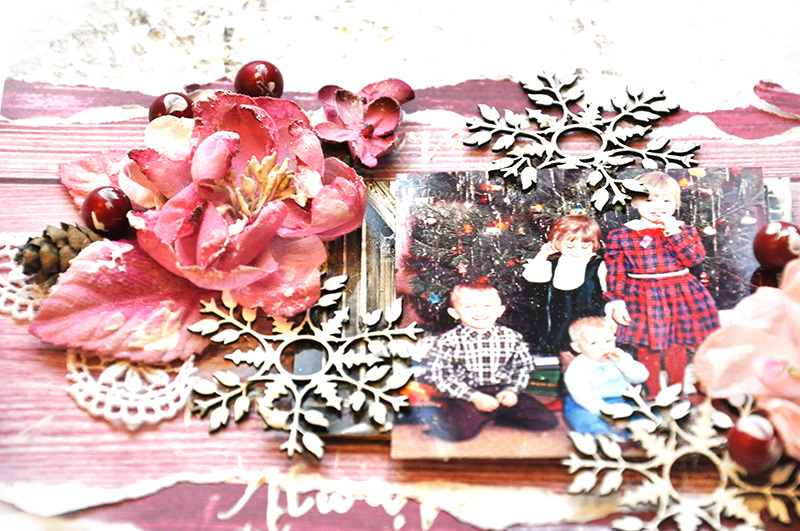 This is how I coated the 2Crafty "St Nick's Snowflakes" and "Holly Twig Branches". Not complex and yet the design is totally eye-catching. 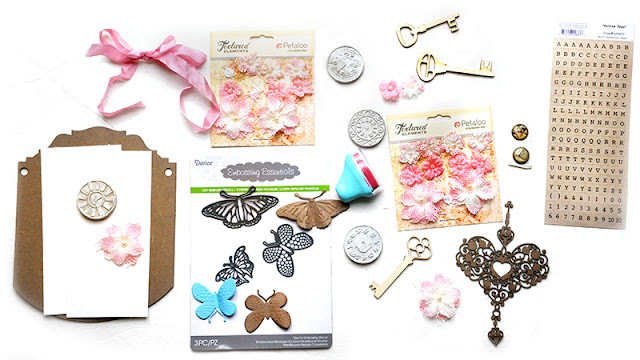 You can find your Flying Unicorn Kits right here. You can find 2Crafty chippies here. You can find many other gorgeous chipboard pieces right here. Don't despair if the kit is sold out. You can pre-order the next kit starting the 20th of each month. Details right here. 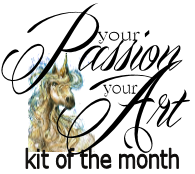 Flying Unicorn January kit of the month , "Your Passion Your Art"
Hello! It's Yasmin here on the blog today and today is a good day! Well.. sort of.. It's my birthday and I'm getting WAY to old.. Hahaha.. But I'm not here to discuss my age or birthday, but to show you my video tutorial made using the lovely January KOM.. I do believe there's still kits avaliable so grab your kits while you can. I've used the mixed media kit, the add on flower kit and some bits and pieces from the two others. And here are the finished canvas. 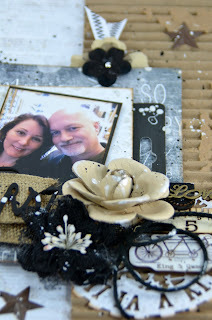 I used a black canvas, misted with paints from 13@rts and added embellishments from Prima. All found in the kit. 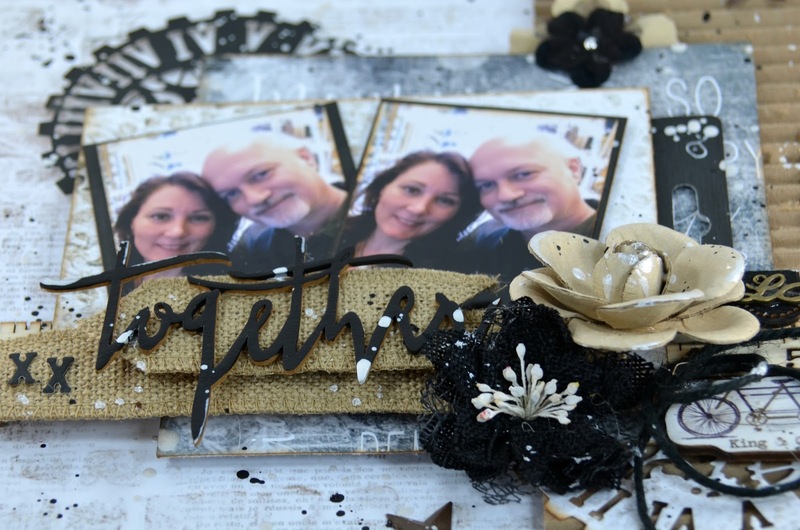 If you'd like to see how I made my Canvas please take a look at my video below. A Close up of my white brushing, and some of the details with the microbeads, glass beads and glass glitter. You can also see some of the stencil details in the background. I have to say I'm quite happy with my canvas and I hope you liked my tutorial. Would absolutly love a comment on my canvas! Thank you so much for stopping by us today! 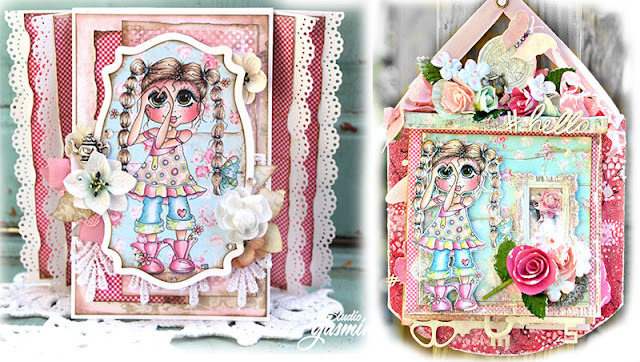 DIY Card With Tutorial Using Flying Unicorns "Small Art Big Passion"
Jennifer Snyder here today to show off the Small Art Big Passion ( also known as SABP) mini-kit. It's my favorite kit bundle each month because it is packed with coordinated goodies that provides card making fun for the month. 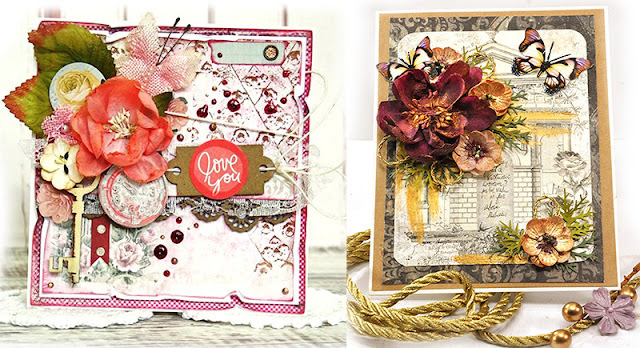 It's all about the love of making cards, tags atc's and anything in between. 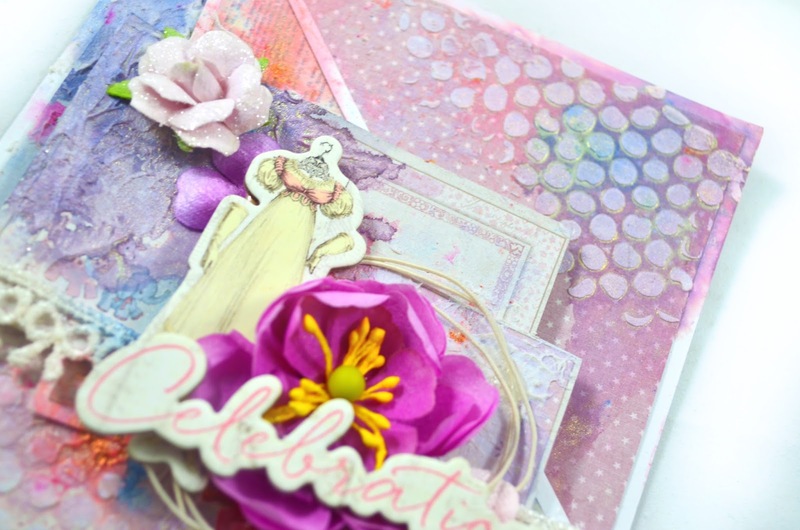 Chock full of bling, flowers, paper, embellishments and pretty things in between! 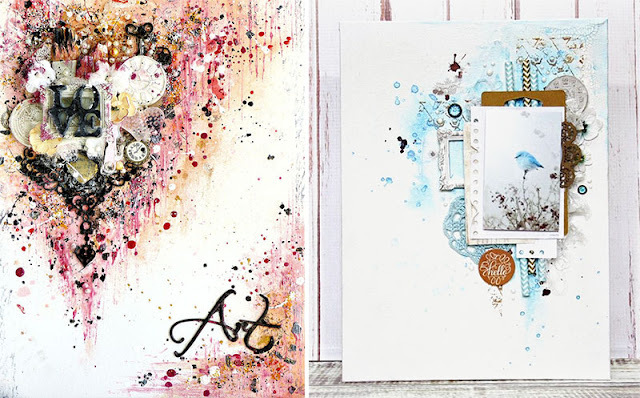 This month's paper collection included in the Small Art Big Passion is from 13Arts, Secret Letters. Here is a close up of the floral cluster on the card I made. Scroll down and I'll show you how I made this. Card Base: The card base was made using the 13Arts Secret Letters 6x6 pad. 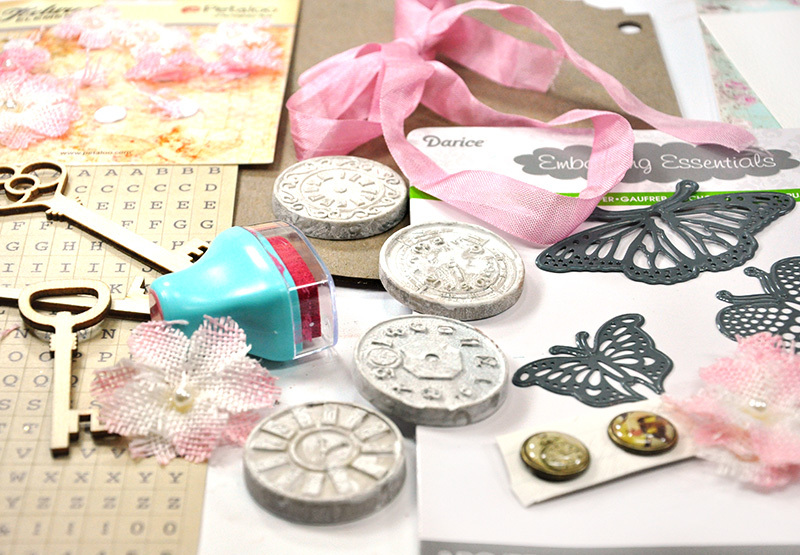 I have the most wonderful edge dies from Spellbinders. 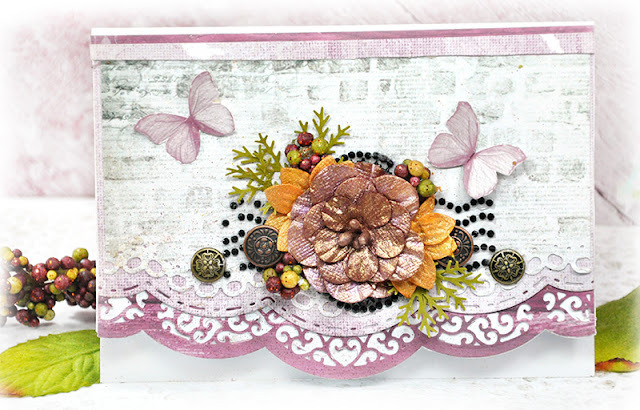 They are Spellbinders Card Creator collection. Gorgeous. The Embellishments Used: Below is a photo of the main embellishments used . These all came from the SABP kit for January. They include; Prima Metal Embellishments, Prima Say It In Crystals ( SIIC) Black Postage 560416, and the Petaloo Flowers - Darjeeling Teastained Pink. Customizing the Embellishments: I customized a lot of the embellishments on this card. It's a great way to make them work for you . First, I took one of the Prima black postage crystals ( also known as SIIC) stickers and cut it in half. This is how I cut it. Customizing the Flowers: The flowers in the Small Art Big Passion (SABP) were Petaloo Flowers - Darjeeling Teastained Pink . 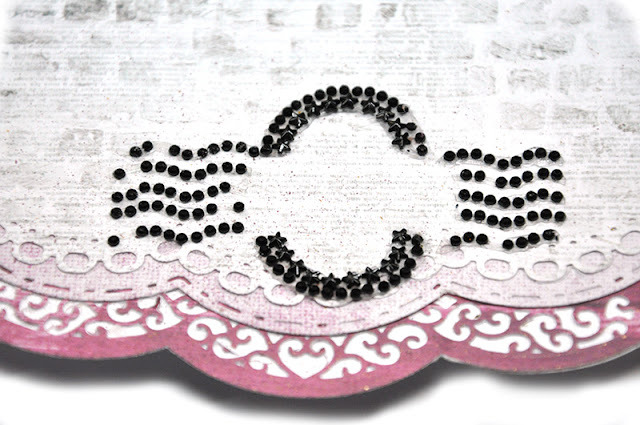 I decided to customize the flowers since pink wasn't quite what I was looking for as an accent color on this card. 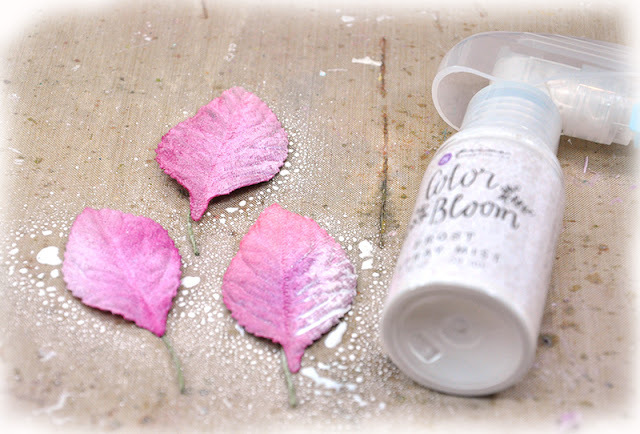 A quick way to customize flowers is to mist them. I used Prima Color Bloom Mists in Empress Gold and Berry Wine mist. 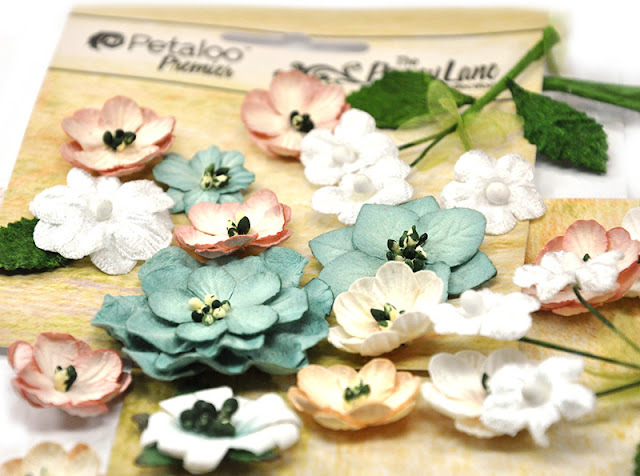 You can find a variety of Prima Color Blooms right here. My second Petaloo flower was misted with Empress Gold and Mustard Yellow. I popped off the top few layers of the flower to make it smaller. I love the photo below because it shows a dramatic comparison between the flower before and after misting. I cut the top layers in half and tucked it into my cluster. I really didn't want a second big flower on my card so cutting it was the best way to minimize it. Additional accents on the card include some butterflies cut from the 13Arts papers, some pine punches as cluster filler, floral berries from my stash and the Prima Metal Embellishments from the SABP kit. Done! Looks elaborate but once you see the steps broken down, it all seems much easier. Hi everyone! Today I want to talk about layouts with that “water color” look on the background. It is super easy to do. I did not take pictues of the steps but I will explain with each close up. Here is a layout I created with the gorgeous January kits. 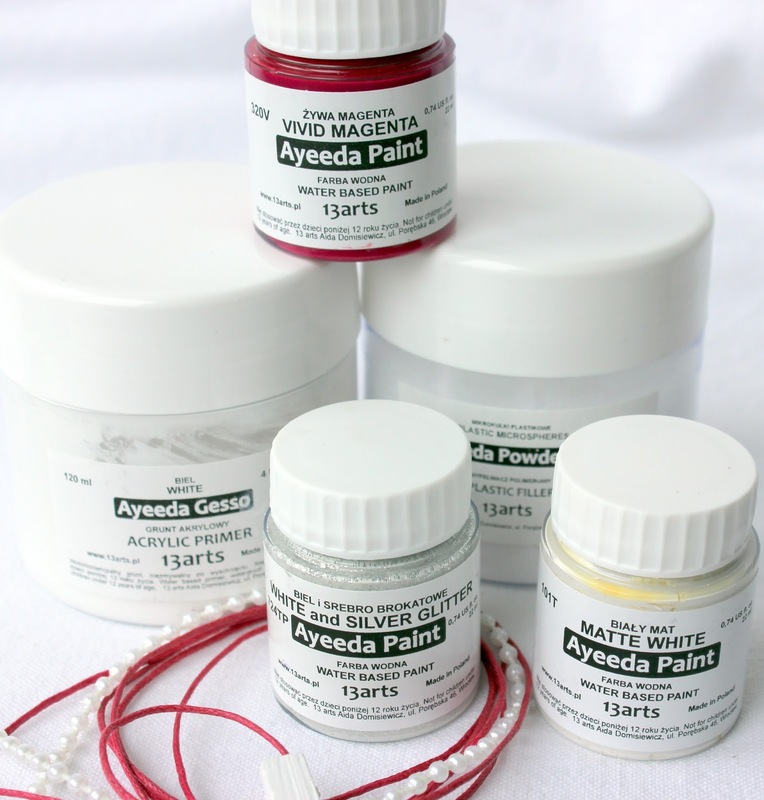 The kit comes with a Clear Gesso from 13 ARTS. 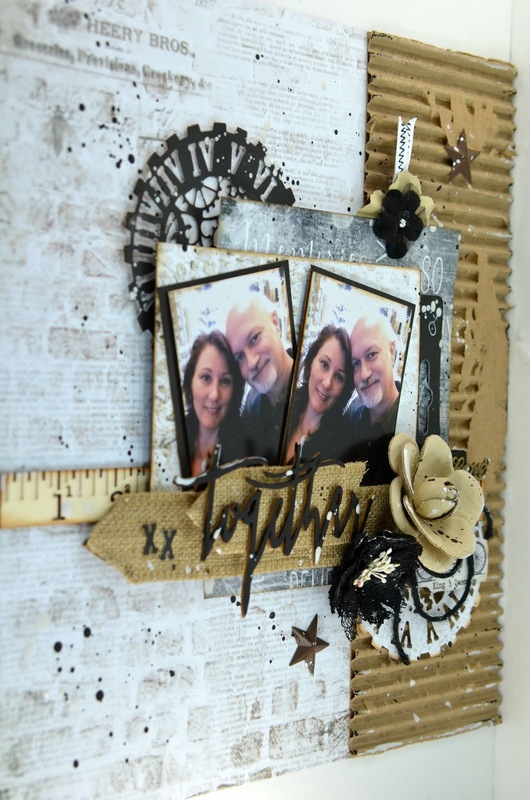 Just apply a thin layer of clear gesso on your background paper, use a sponge or paintbrush. Heat set or let this air dry. 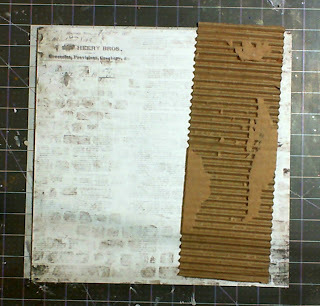 Once dry I added my stamping and masking and heat set that. After all of your layers and photo are in place I used some Shimmerz Inklingz and just painted it on the background…one color at a time and add some spritz of water to make the Inklingz pool. I actually add quite a bit of water at this point. 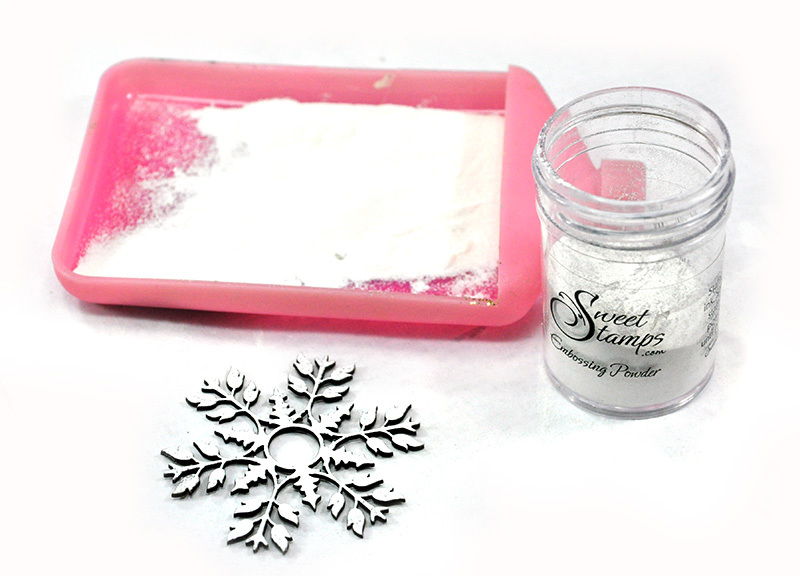 You can also use mists for this part, and spritz with water also. Heat set after each color and move the water with the paints around, with your heat tool. Add the next color and do the same steps as above. 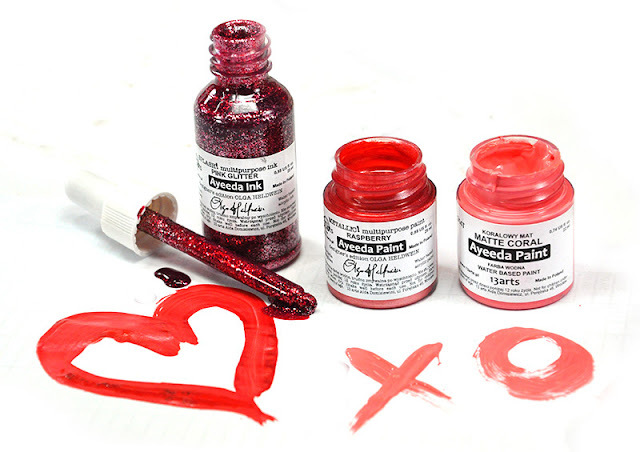 You can add as many colors as you like…just dry between colors. 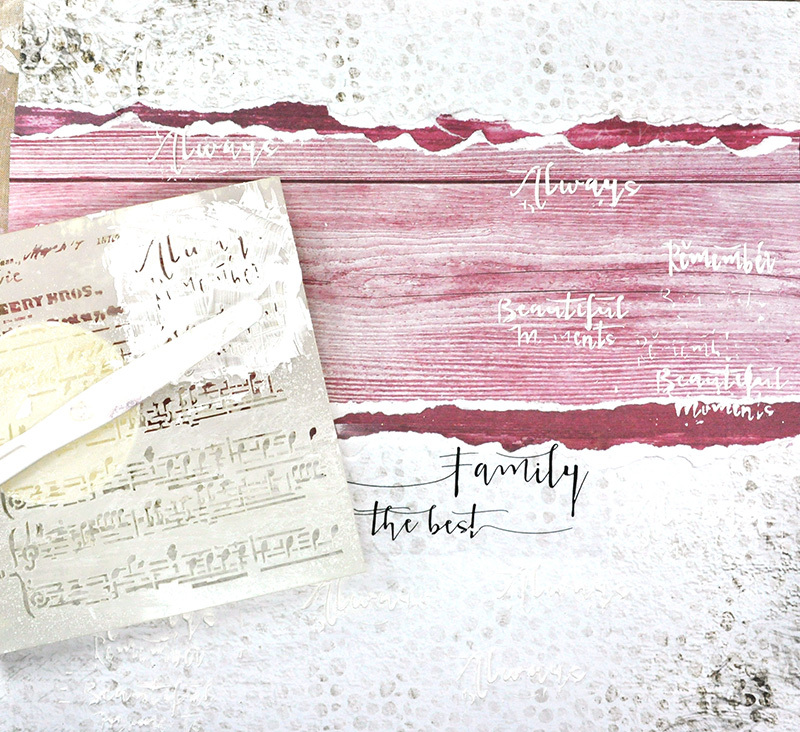 Adding the first layer of clear gesso allows the mists or paints to just pool on top of the background paper. If you did not the color would just soak into the background page and you would not get this cool water color look. Another little tip. If you have already adhered your photo to the project just make sure to cover it up with some scrap paper or something so that it does not get sprayed with water. 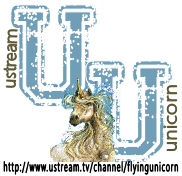 Uni-stream is Back this Wednesday Night! This week we have Song as our Uni-Stream Educator. 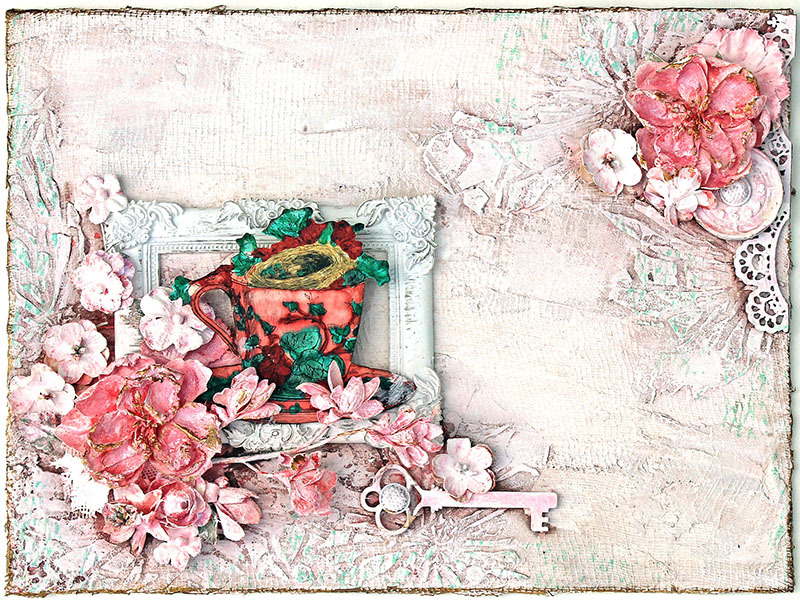 Song is going to take us step by step in creating this one of a kind fun mixed media card. So put the tea kettle on and join the uni team and your friends for an hour of educational fun! Hi everyone! 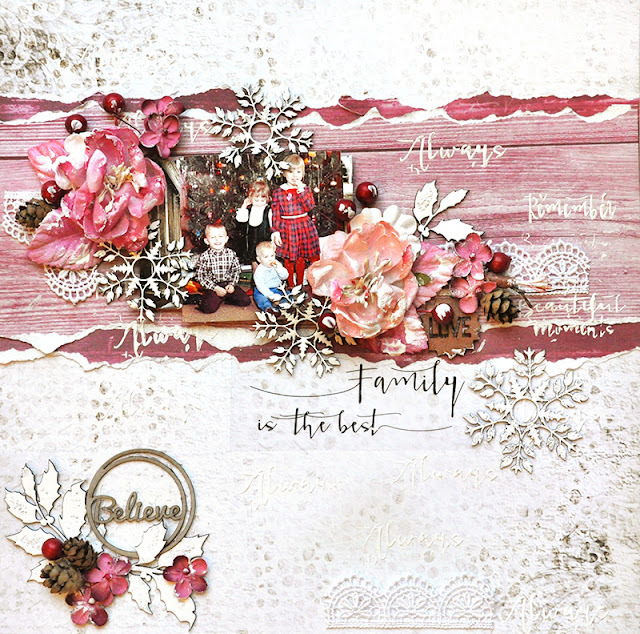 Thrilled to be sharing with you today, our guest designer Lisa Gregory's work, with our January KOM. Love how she worked her magic with the OTP and the rest of the kit!! 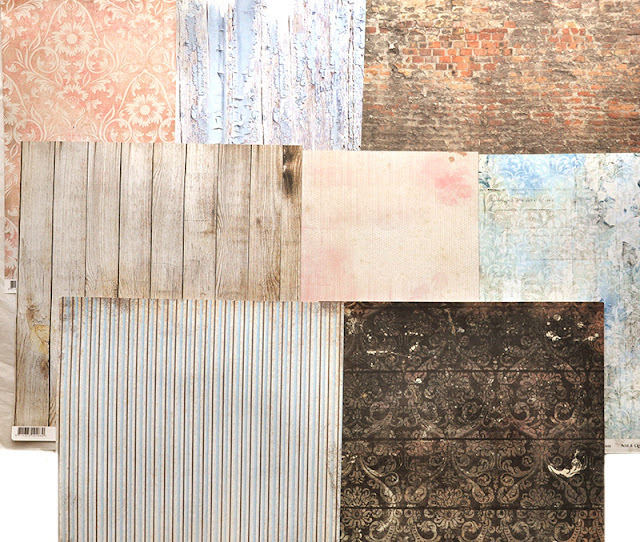 It's always exciting at reveal time to see what each artist brings out in the kit. This month's romantic pink hues from the 13 Arts papers, and all the other yummy delights found in the kit! Lisa sure worked her magic! Let's take a look at them shall we?!! First up the OTP. Lisa took the OTP to a whole new level and converted it to a beautiful mini!! Can you not feel the romance here?!! So Soft and dreamy!! She also made a wonderful reverse canvas using the Mixed Art kit. So adorably sweet with her adorable grandbaby!! 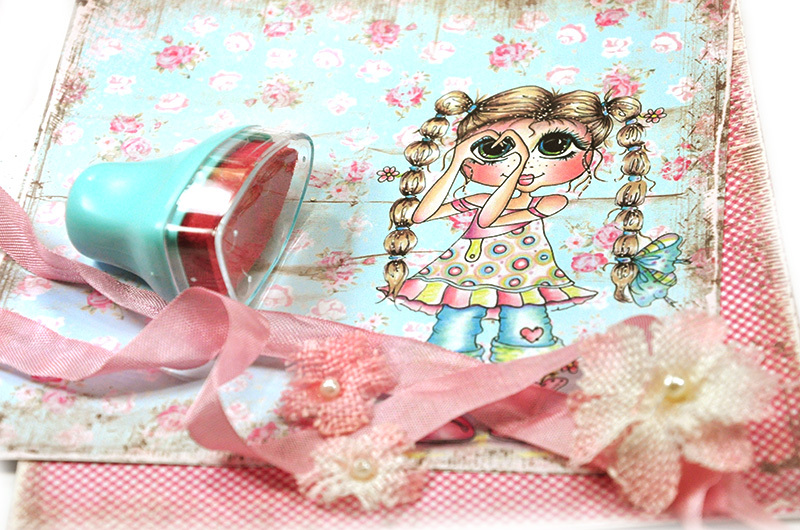 Awww I think that little doll was the perfect embellishment too!! :) Love how the black makes those pinks POP!! From the Main Kit Lisa created a gorgeous LO. 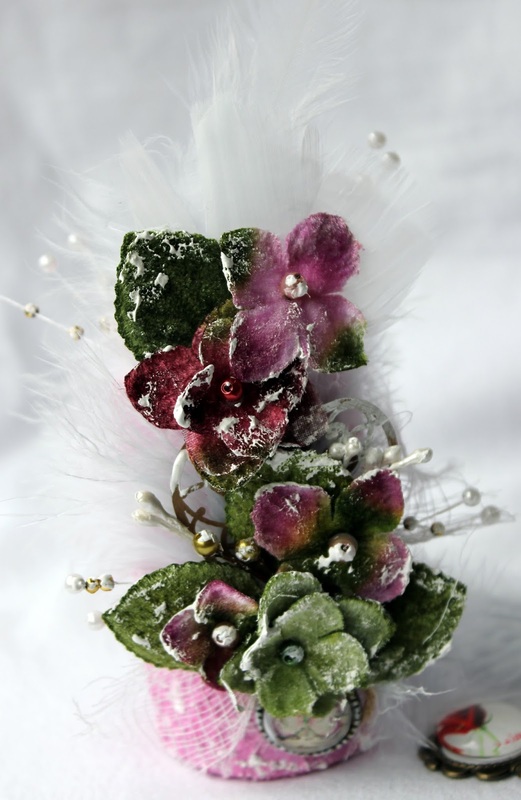 Complete with handmade and Prima blooms!! Be sure to keep an eye out on our Facebook page to see more of Lisa's work this month! !